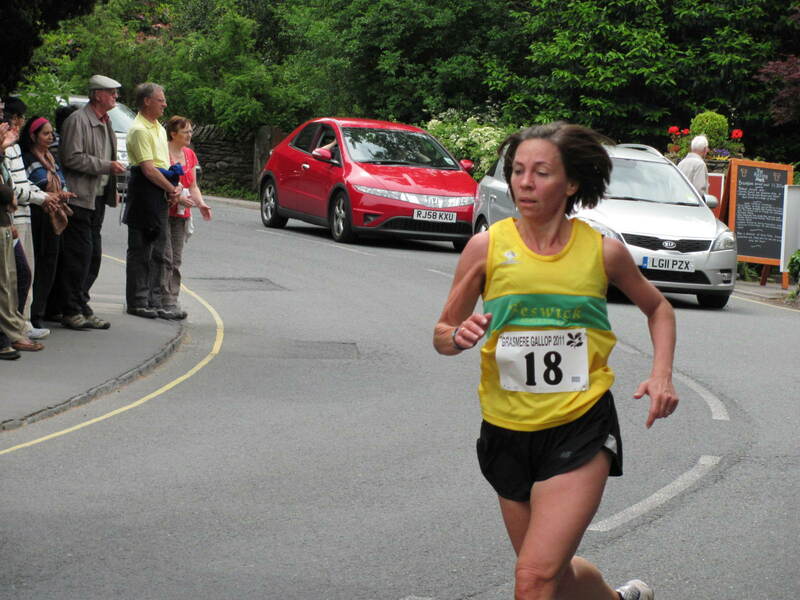 Photos and Facts from Grasmere Village. 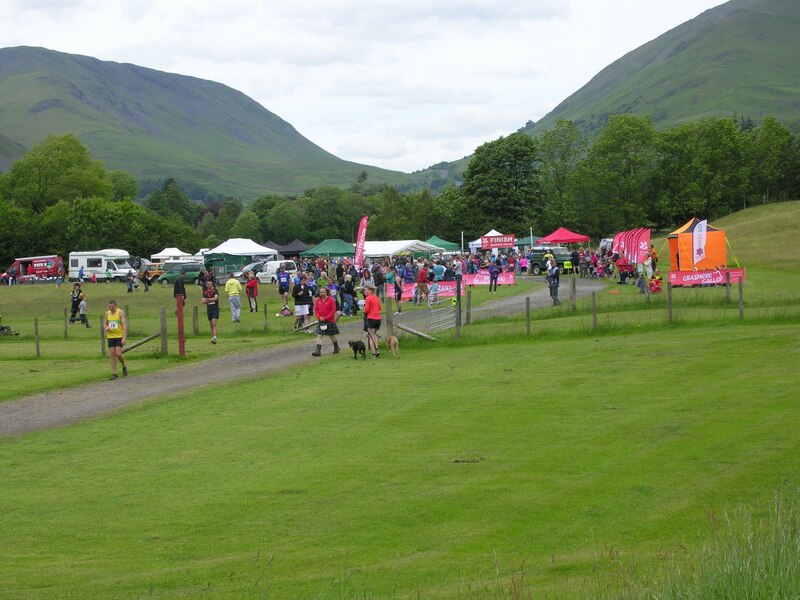 Another year gone, and a round up of what happened in Grasmere Village in 2016. It was a year many won’t forget in a hurry. We might be a small village but there is always something going on. Especially this year, Prince and Prime Minister, Cyclists and Wrestlers it was all happening this year. After the stress and strain of Storm Desmond it was lovely to discover that a sunny photograph of National Trust Property Allan Bank graced the front of the 2016 Handbook. A great advert for the village. Unfortunately things were very quiet in the village. The main A591 closed between Grasmere and Keswick and the village literally a cul-de-sac. Various initiatives like free parking were offered but it really was deserted as you wandered round. We had a visit from the then Prime Minister David Cameron spotted in the school playground. Snow on the tops in February and then on lower ground too. Valentine’s Day visit to the Dove Cottage restaurant was a surprise with a cherry “heart” when I cut my cake. Very appropriate and tasty too!. Meanwhile the environment agency were dredging the River Rothay, taking care to not disturb the crayfish, and these canoeists were quick to take advantage of a new launching area into the river. Storm Desmond was still having it’s effect. 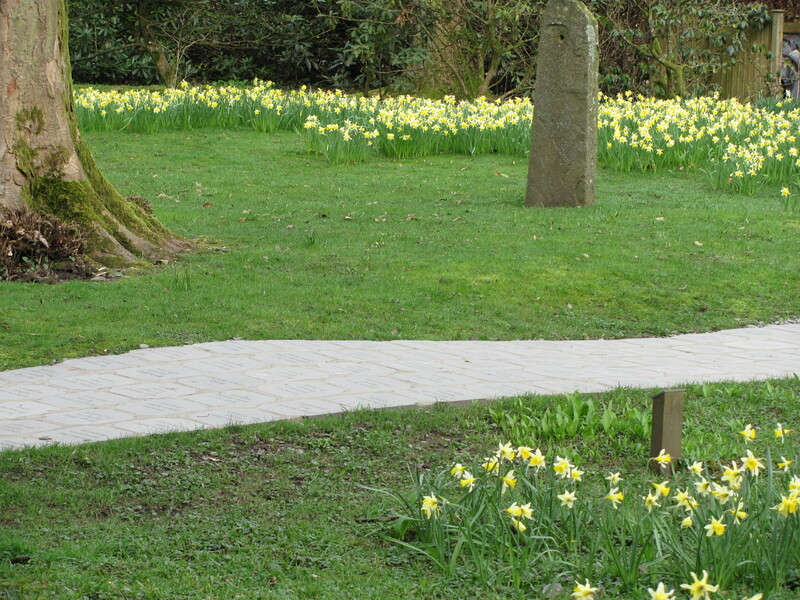 After a dismal Winter signs of Spring were appearing with snowdrops and Daffodils at Wordsworth’s Grave. The rubble that was piling up on the Sports Field after all the dredging was a perfect viewpoint for this cheeky Herdwick. Elsewhere in Grasmere and throughout the central Lakes Herdwick sheep of a different kind were appearing as part of the Calvert Trust Go Herdwick fund raising initiative. Temporary bridges were built on the A591 and a little mini bus started running between Grasmere and Keswick, my goodness it was popular! It ran along the far side of Thirlmere and became quite a tourist attraction in itself. We had another famous visitor. Prince Charles visited with a trip to the Gingerbread Shop, Wordsworth’s Grave and St Oswald’s Church. It certainly made the village busier. April and things were looking up in the village both visitor and weather wise. An exciting initiative in May brought coloured lights to the mere. Nocturnal Rainbows as part of Lakes Ignite Art installation. 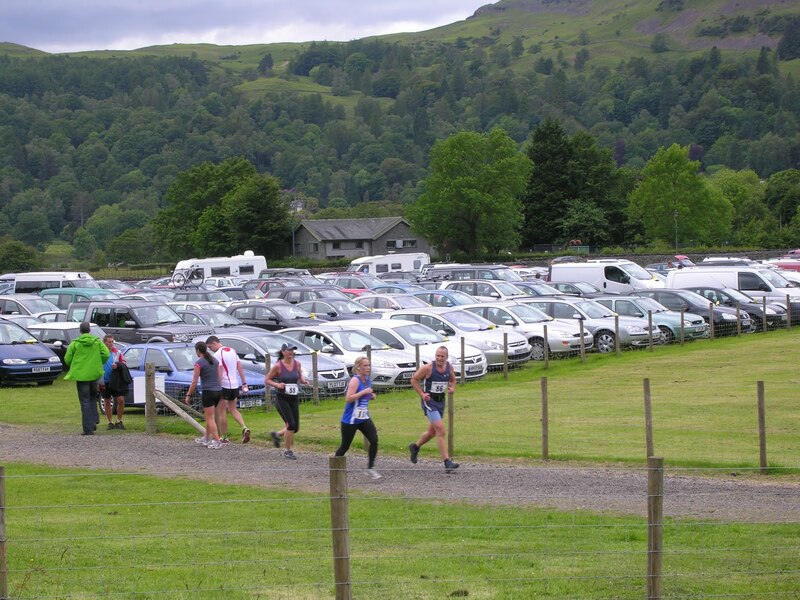 As the tourist season started properly it was still a case of getting the message out everywhere that Grasmere was open for business. Grasmere does look great in May, blossom and bluebells. Bannerigg Woods were a sea of blue. And then at last! Dunmail Raise was open and Grasmere was connected with the North again. Hello Keswick we missed you. Diessen Brass Band (twinned with Windermere) performed at NT Allan Bank and the music echoed through the valley. Grasmere celebrated The Queen’s 90th Birthday. The village looked lovely with flags flying everywhere. Grasmere Glee celebrated in the Village Hall. 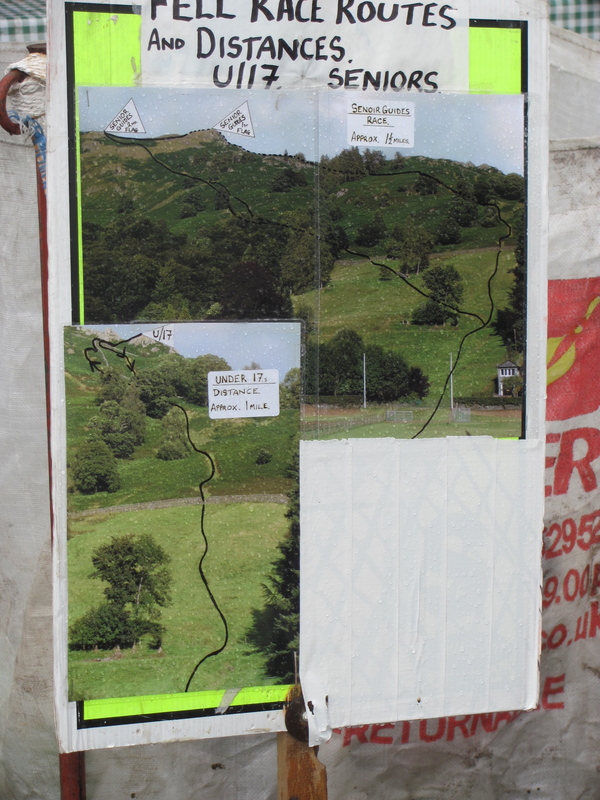 Kendal Mountain Festival kindly brought outdoor cinema to Grasmere and Glenridding to support the flooded villages. The weather was kind and a great time was had by young and old alike. 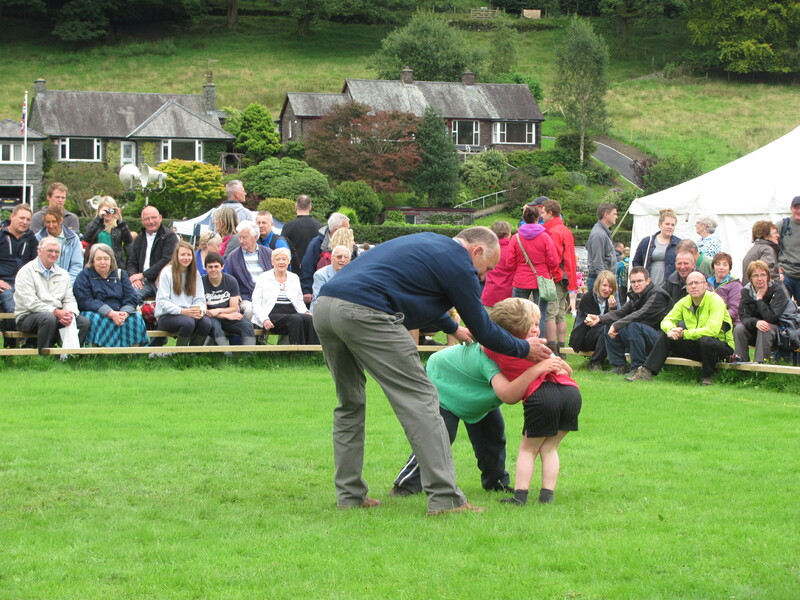 July in Grasmere means Rushbearing. A rather wet one this year and the Rushbearing Maidens had a rather soggy walk round the village but kept smiling. But it wasn’t all rain in July, the sun shone too. 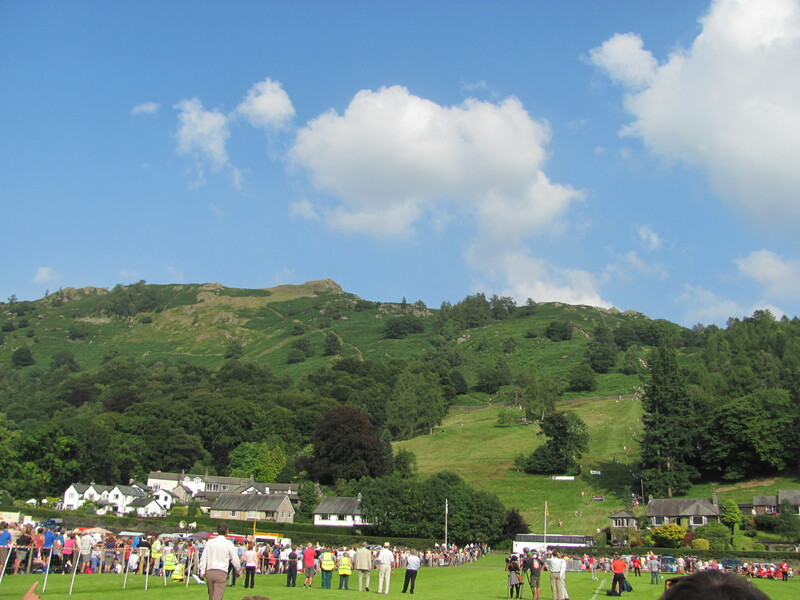 August Bank Holiday and the 166th Grasmere Sports and Show. After a night of rain morning broke fair and a good turnout of visitors and locals alike enjoyed the Sports and entertainment on the Sports field. Competitors travelled from all over the world to compete. Fire eating was a popular spectator event. 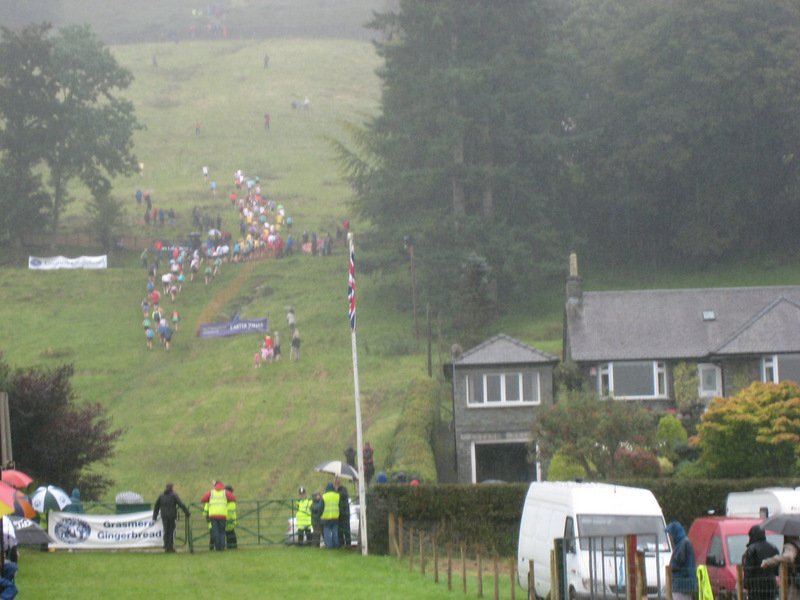 Cycling came to Grasmere in September when the Tour of Britain sped through the village. The village was decorated with painted yellow bikes. Halloween in Grasmere meant an abundance of Pumpkins throughout the village. Unfortunately Halloween weekend itself was a bit of a washout and the pumpkins on the village green looked a bit bedraggled. Liked these pumpkins outside the Gingerbread shop. Nights drawing in and streets empty by 5pm as the clocks change. 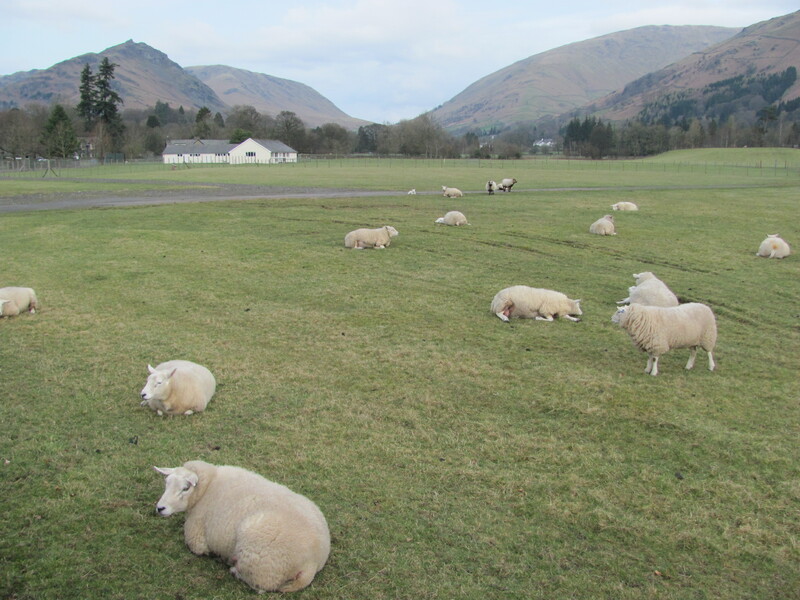 Locals practice a form of reverse hibernation and suddenly you bump into friends in the street who have had heads down all Summer working hard to make our visitors to Grasmere enjoy their stay. I was very, very lucky to win a holiday to South Africa for most of November so from 24 degrees to -4 degrees, however what a sight as we arrived back. What a great welcome home! December in Grasmere, what a joy. You never know who will be about, Taffy Thomas former Storyteller Laureate was having a wander round the village with some student teachers. The shops have a huge array of individual gifts you can’t find in the larger towns. A wander up the hill to National Trust Allan Bank and the sound of bells were ringing out as the Beetham Bellringers played. Very festive. Just time to put the Christmas tree complete with Herdy bobbles up and that’s nearly it for another Grasmere year. Grasmere Players Pantomime still to see, always a great family occasion. Wishing all my readers a Merry Christmas and Health and Happiness for the coming year. 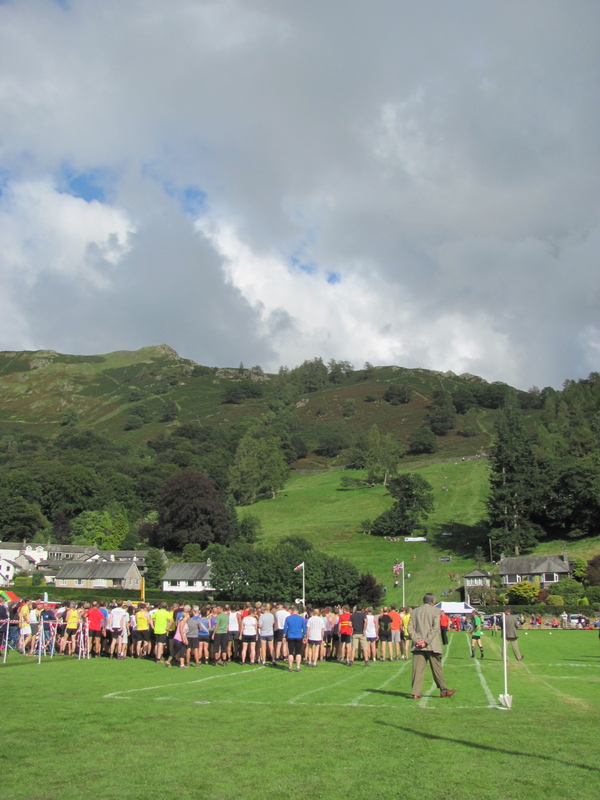 There is an old Grasmere saying “It always rains on sports day” and quite often it does, however this year was different. I always draw back the curtain on Sports day morning with trepidation to see what the weather is like. This year I was greeted with early morning sunshine, and the promise of a beautiful day. Visitors had arrived from Scotland, they had visited the Sports before but never seen it on a sunny day. We set off early as we wanted to see the Sea King Helicopter arriving on the field. 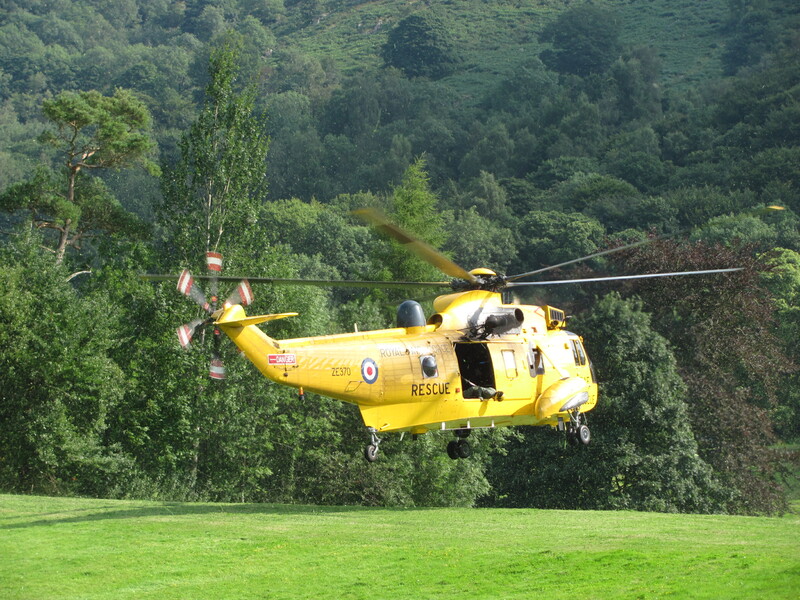 These are the helicopters you see in the Lake District helping the Mountain Rescue teams. It flew over the sports field and circled several times before coming in to land. It stayed on the field for quite some time and people enjoyed getting up close to it. 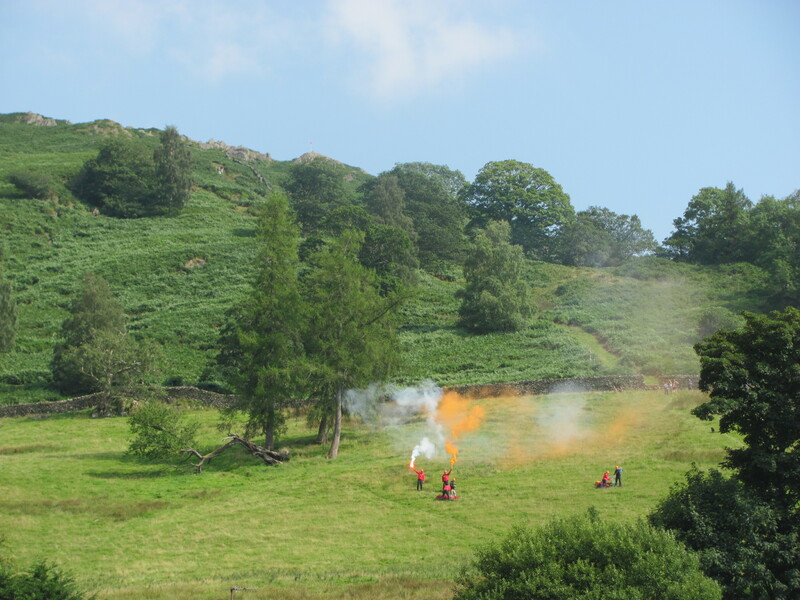 Later in the day it did a simulated rescue with Langdale and Ambleside Mountain Rescue Team. 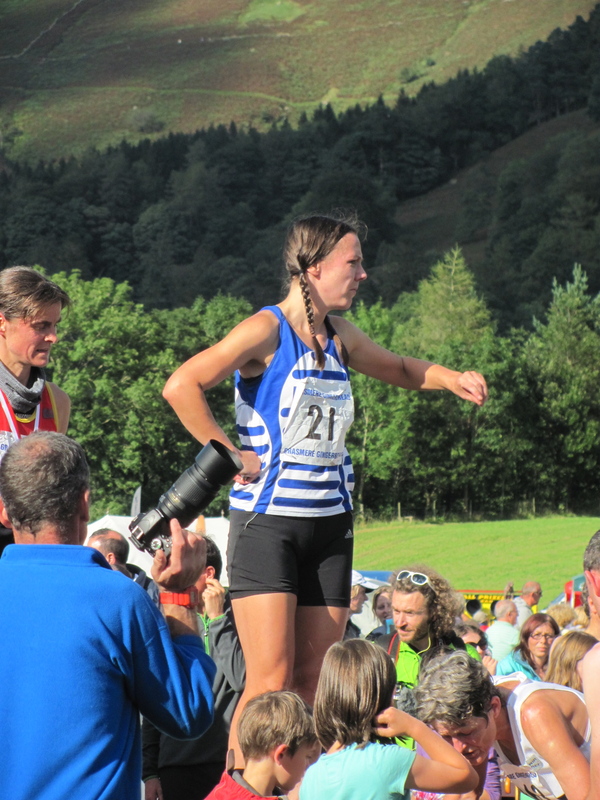 Previously in this blog I have written about the history of Grasmere Sports, and also about the different sporting events, but there is another part to the day. It is a family event with fun for everyone. 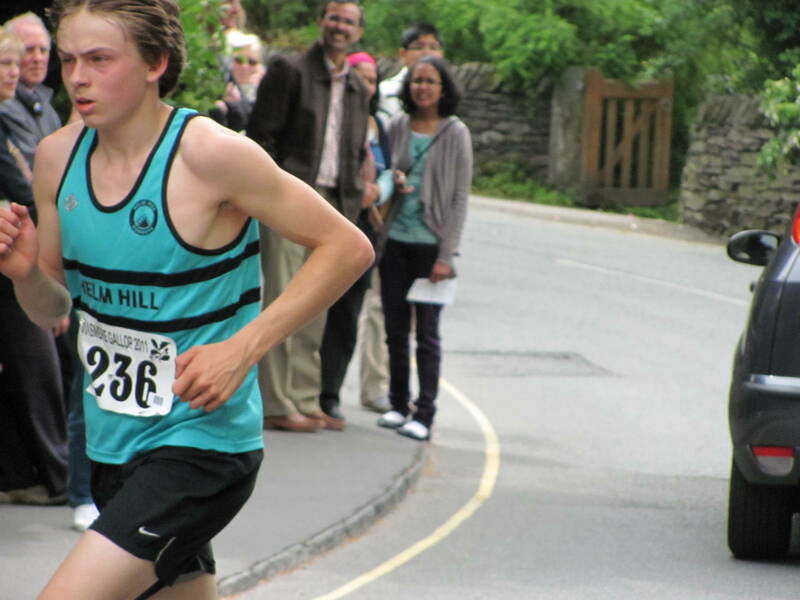 This was obvious by the amount of competitors in the children’s races. 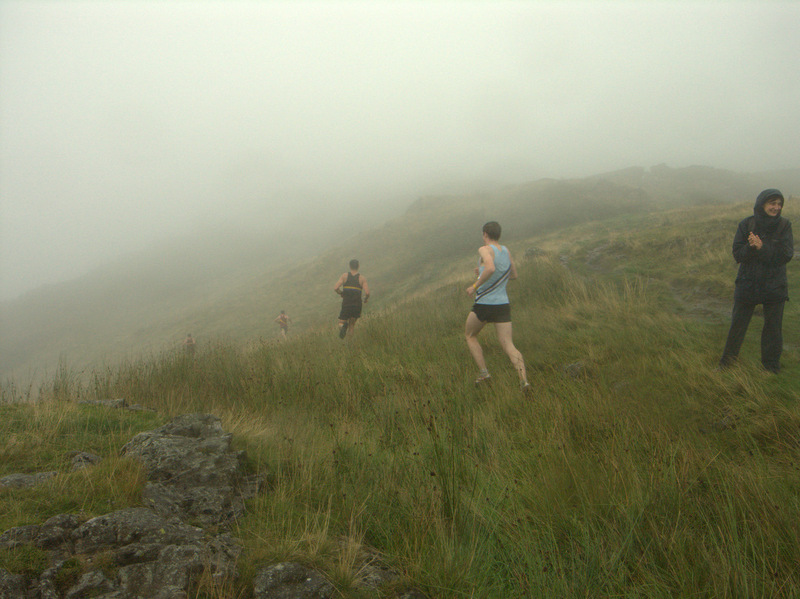 Maybe we were watching the Fell Runners of the future. 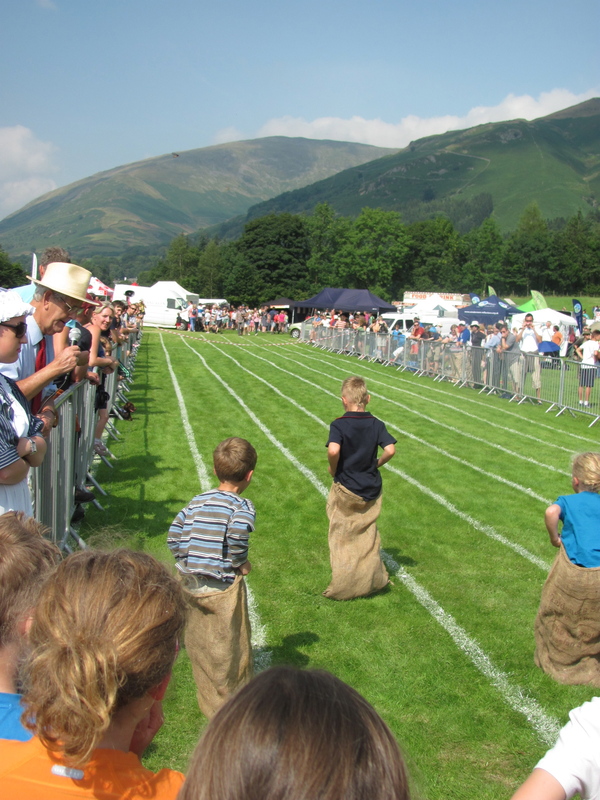 And you can’t have a good sports day without the old favourites like the sack race. Meanwhile , the four legged members of the family were having their own event. 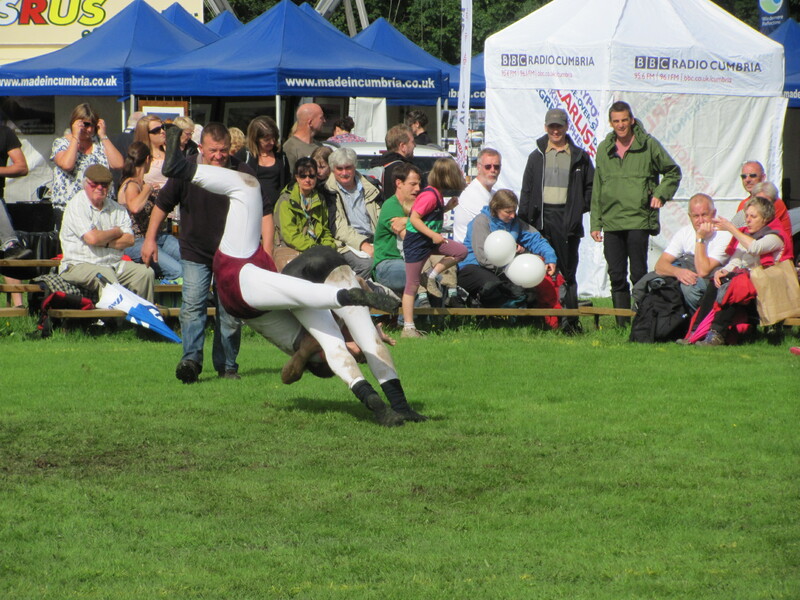 On another part of the field there was Juggling fun. Think the parents were enjoying it as much as the children!. But for me the highlight of the day was the tug of war. After various bouts it was decided to have a Vegetarians versus meat eaters event. The Vegetarians won! 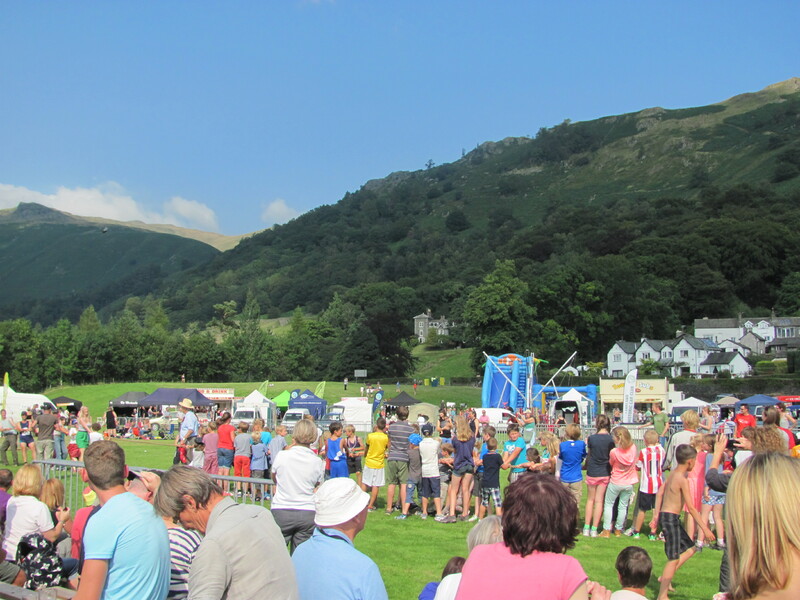 Around the field, more entertainment in the form of Grasmere’s own storyteller Taffy Thomas, a Herdy Knitalong, stalls from Made in Cumbria, featuring among others the very talented Lake District photographer Nina Claridge. 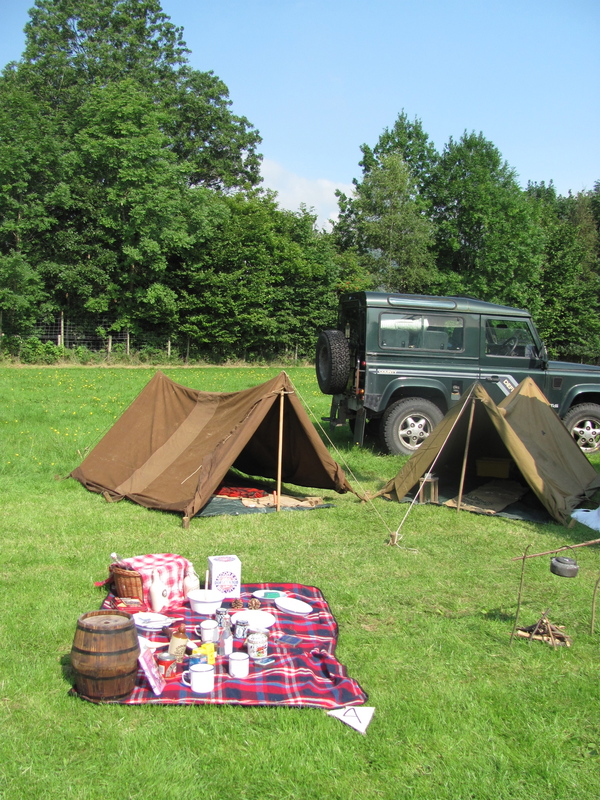 There was also an interesting Tea Company based in the Lake District called New Leaf Tea Tasters. As anyone who knows me knows, I love tea, but I bought something i’d never seen before. 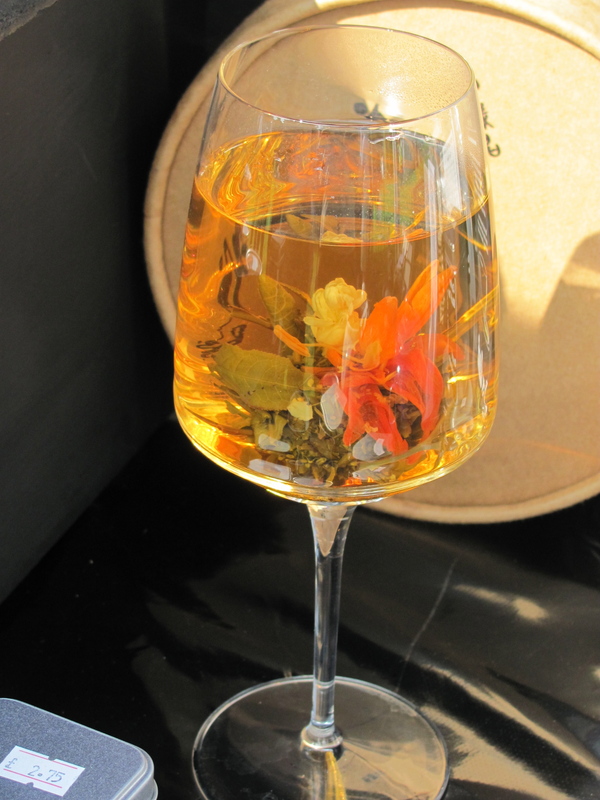 A China green tea called Tiger Leaping Flower Burst. Look away now anyone who knows me as you may be getting it for Christmas. You put the tea ball in boiling water and …..
As the name says, it turns into a flower. Tastes good too. Time for a last look around the stalls before concentrating on the events. We liked this little display by The Arthur Ransome Society. 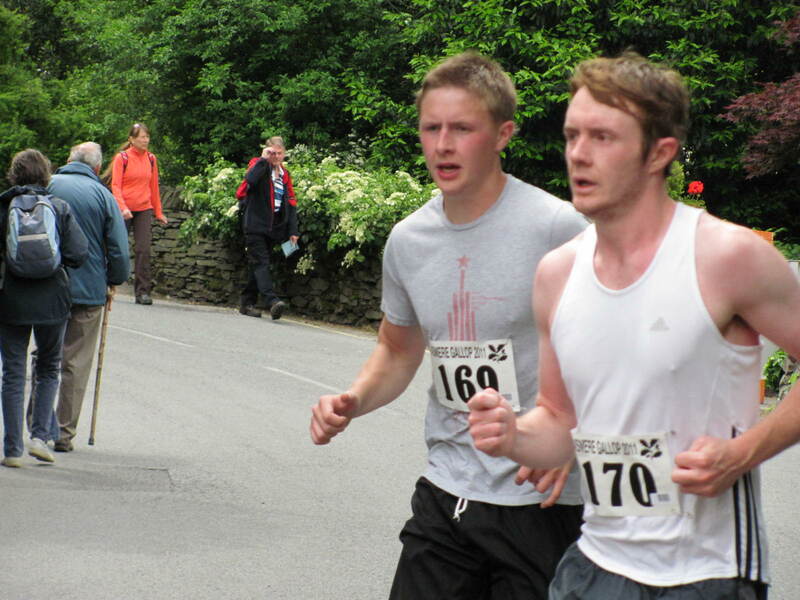 Good to see the Wordsworth Trust and Windermere Reflections there too. Meanwhile up on the fellside LAMRT and the Sea king helicopter were in action again. 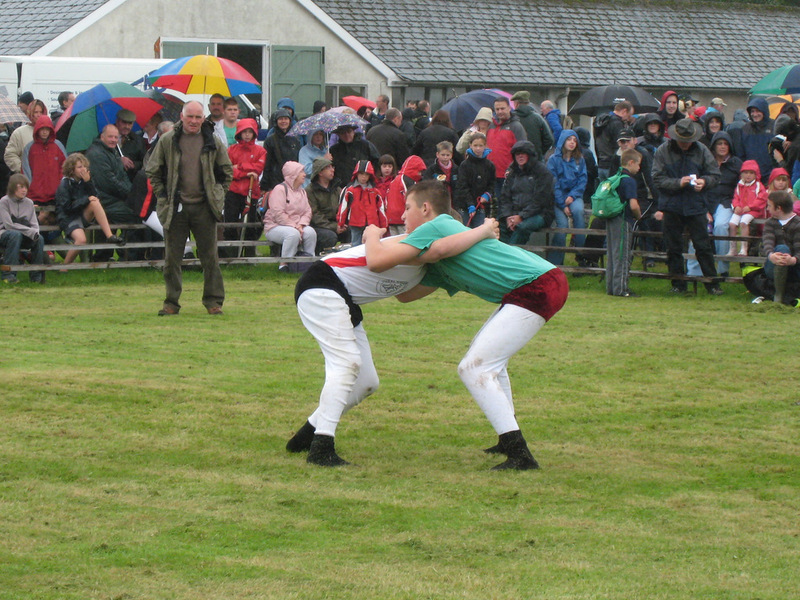 One of the most popular events is the Cumberland and Westmorland Wrestling. However my favourite has to be the senior guide race. 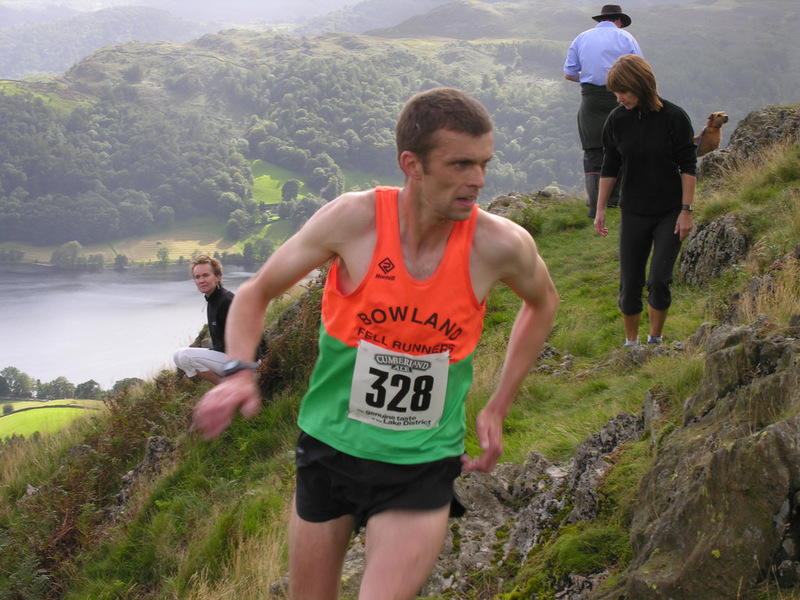 To see the runners stream up Butter Crags really is one of the most amazing sights. The atmosphere in the sports field is unbelievable. It is a real feat of athleticism and has to be seen to be believed. 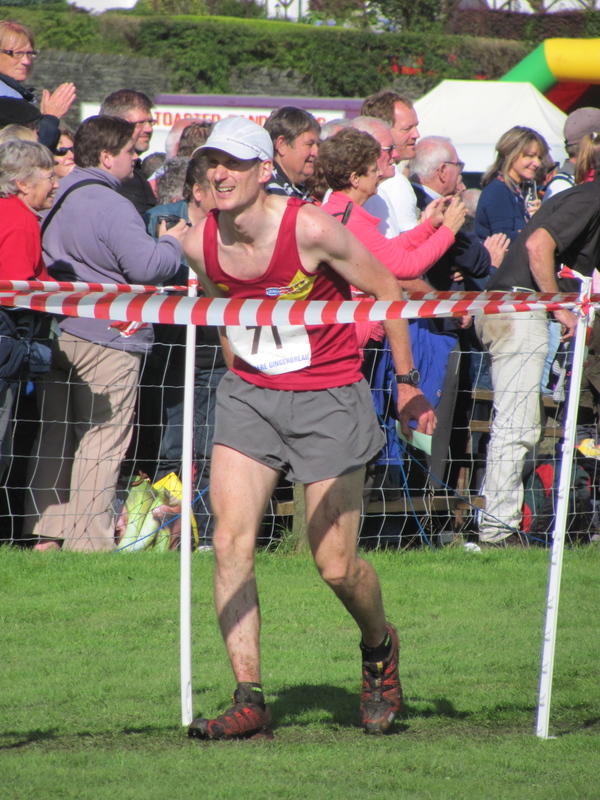 And first over the line for the 9th time in a row …… Rob Jebb. And let’s not forget the Ladies. 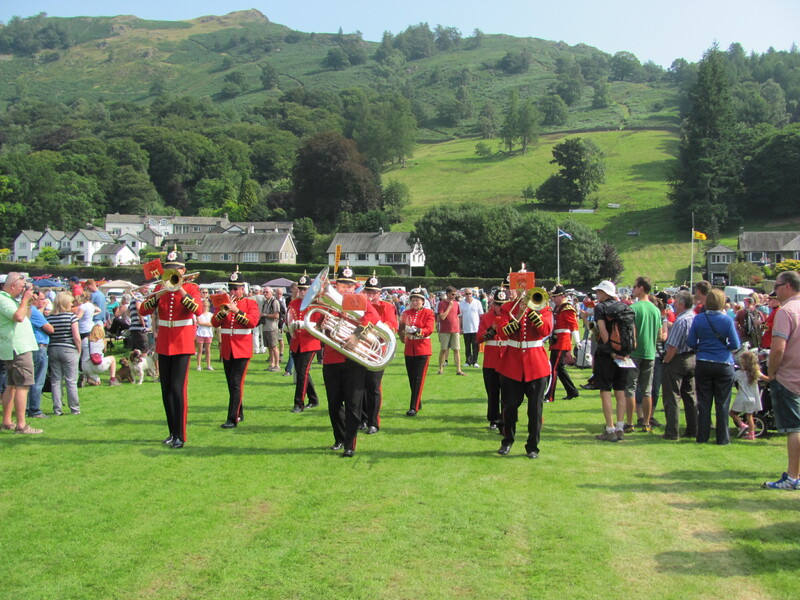 So let’s let the Adamson Band play us out after a fantastic day at Grasmere Sports and show. Time to get your diaries out. 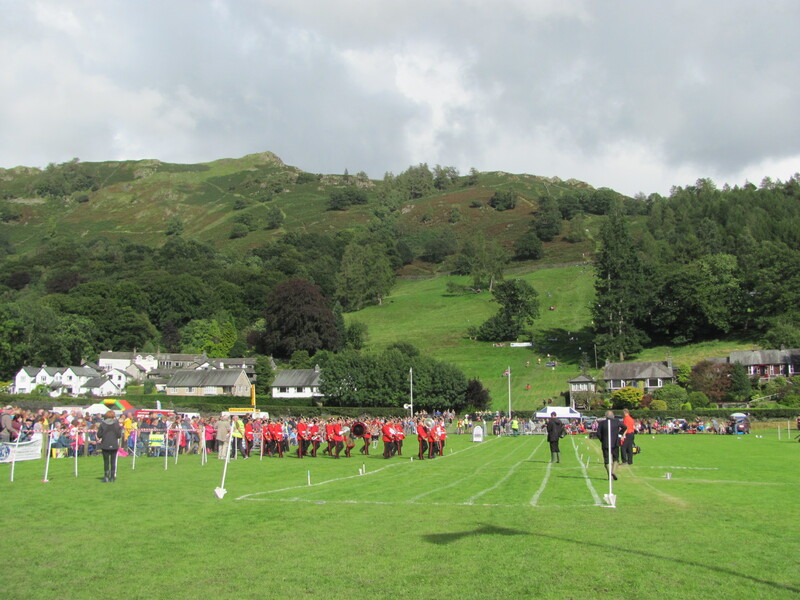 Grasmere Sports and Show Sunday 24th August 2014. See you there!. 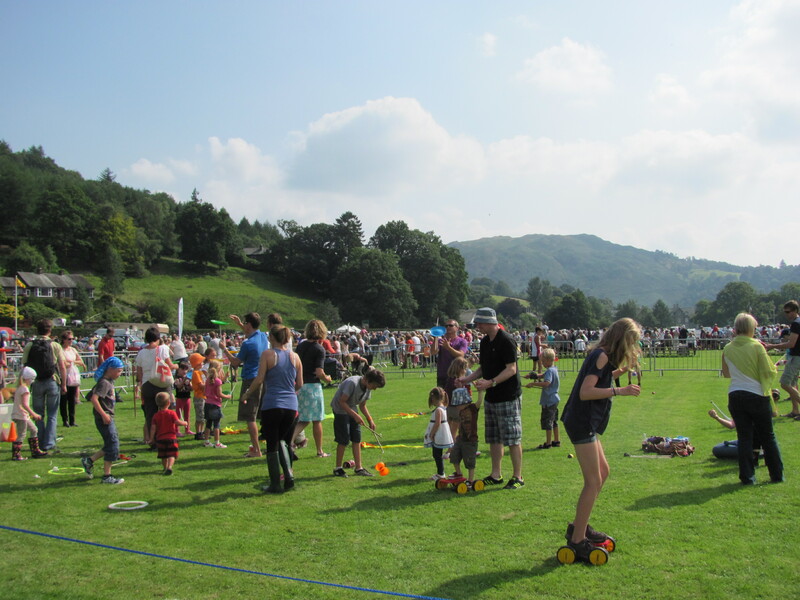 The Olympics may have been held in London this year, but here in Grasmere we have our own “Olympics” every year. 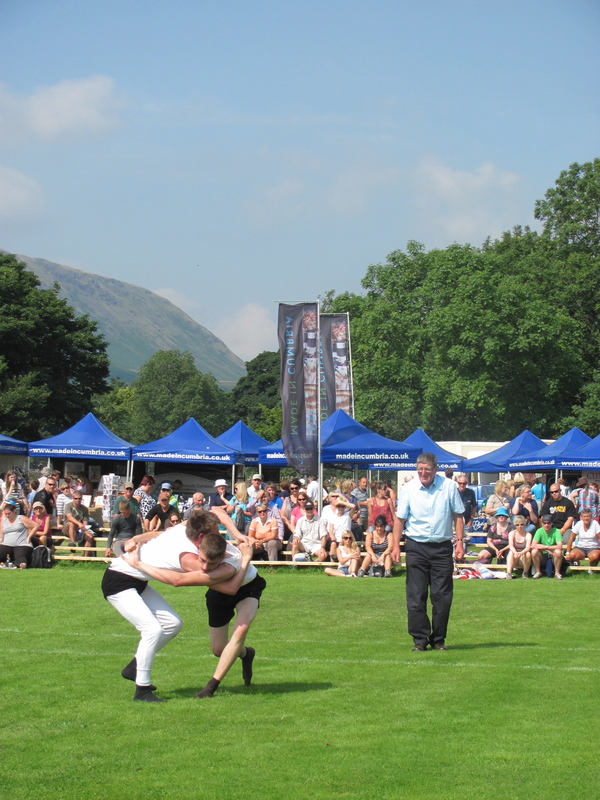 The 162nd World Famous Grasmere Lakeland Sports and Show was held this Bank Holiday weekend. As usual competitors arrived from many countries not just locally. 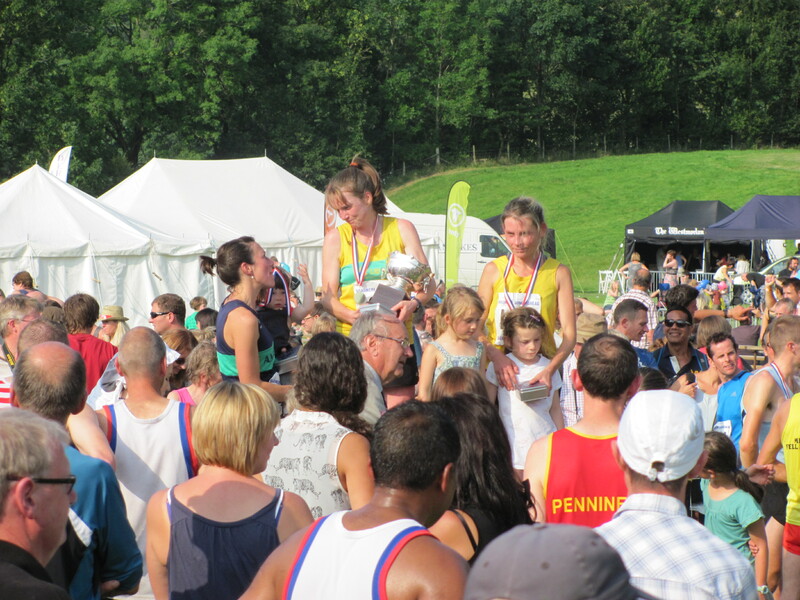 I have written previously about the history of the sports in this blog so let’s just have a look at events this year. 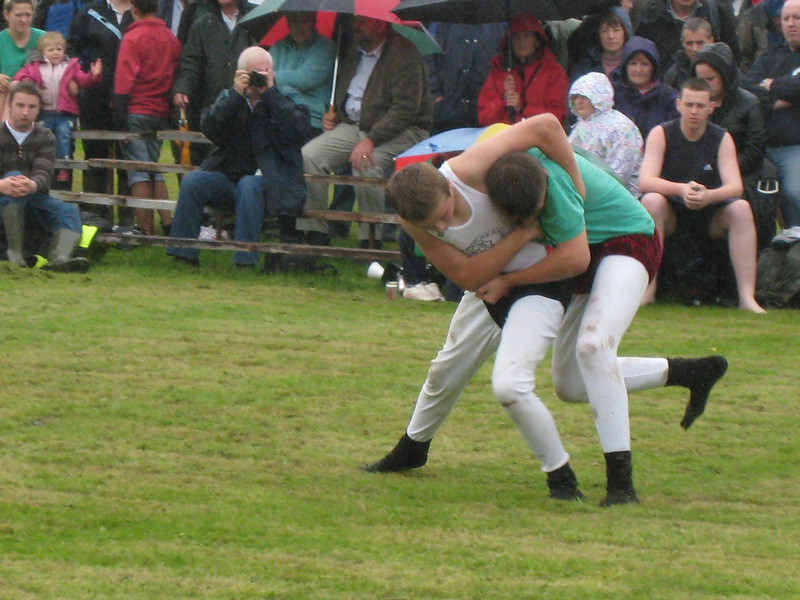 One of the most popular events is the Cumberland and Westmorland Wrestling. Different Countries have different styles. 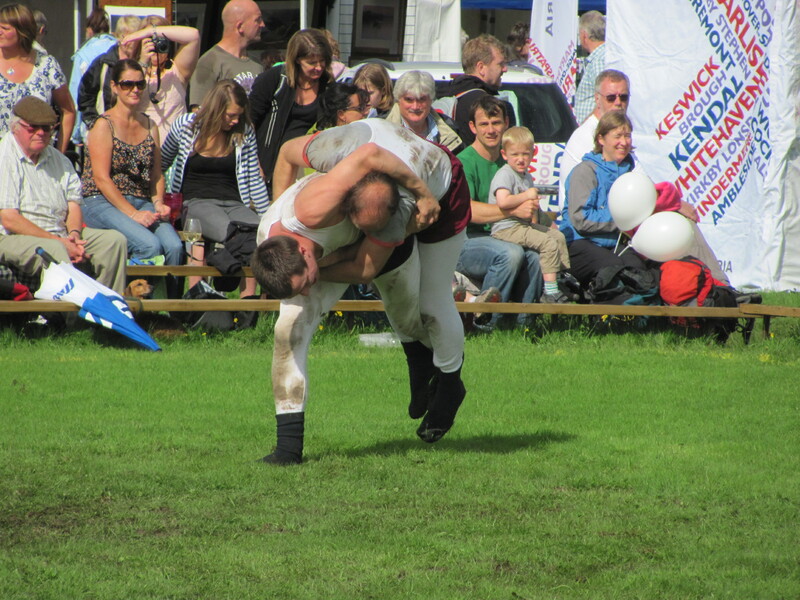 Switzerland has Schwingen, Iceland has Glima, Brittany has Gouren, and Britain has Cornish style and of course the famous Cumberland and Westmorland Wrestling. As you can see above, they start them young! Once the referee says “Wrestle” they start and the crowd really gets behind it. It’s quite a quick sport and you can easily pick up the finer points. Generally the usual way to win is to get your opponent down on the ground so that he touches the ground with any part of the body except the soles of his feet before you do. You can also win if a wrestler breaks his hold. Of course like every sport there are correct terms for different techniques. Dog-falls, hanks, hipes and chips are some of the terminology you will hear as they battle it out. “Best of Three” is the winner. In case you think it’s only the men who wrestle, I can assure you the women take part too. So many shows have been cancelled because of the rain we have had this summer. 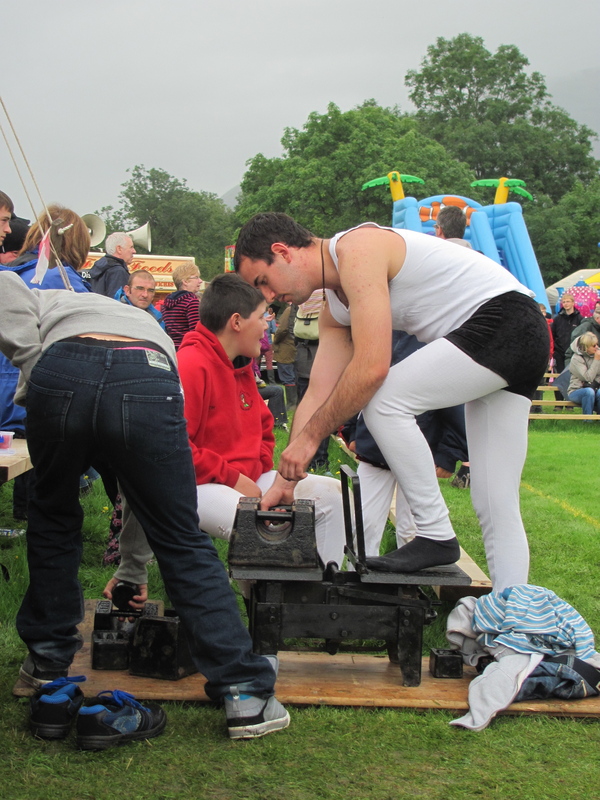 In fact I was at a show earlier in the week where they were hauling the cars on to the sports field by tractor. Now i’ve seen cars being hauled off many a time but never on!. So the first part of the morning had gone well at Grasmere, then the heavens opened. It was only a downpour of about 20 minutes but it certainly had folk scurrying for cover. I don’t think the craft tents knew what had hit them. Luckily it was over quickly and the rest of the day was fantastic with warm sunshine. 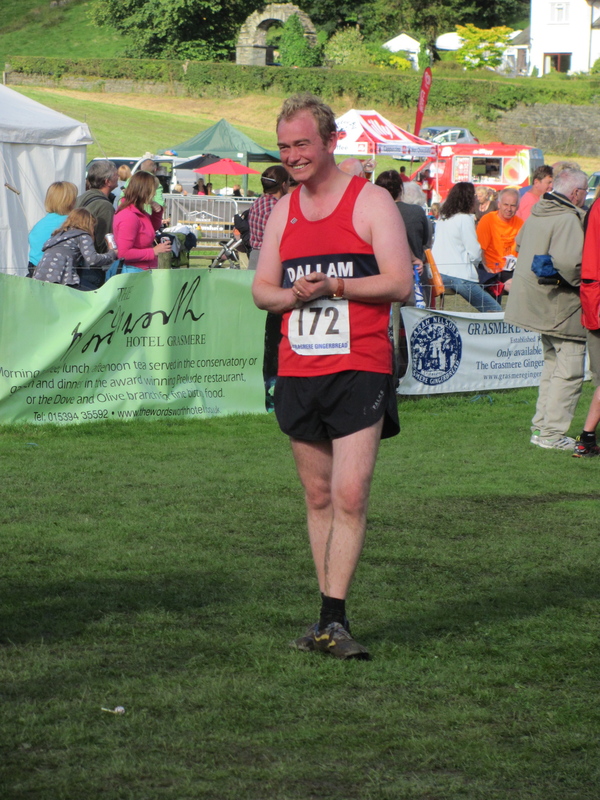 However it made the fells a bit slippy for the fell running. 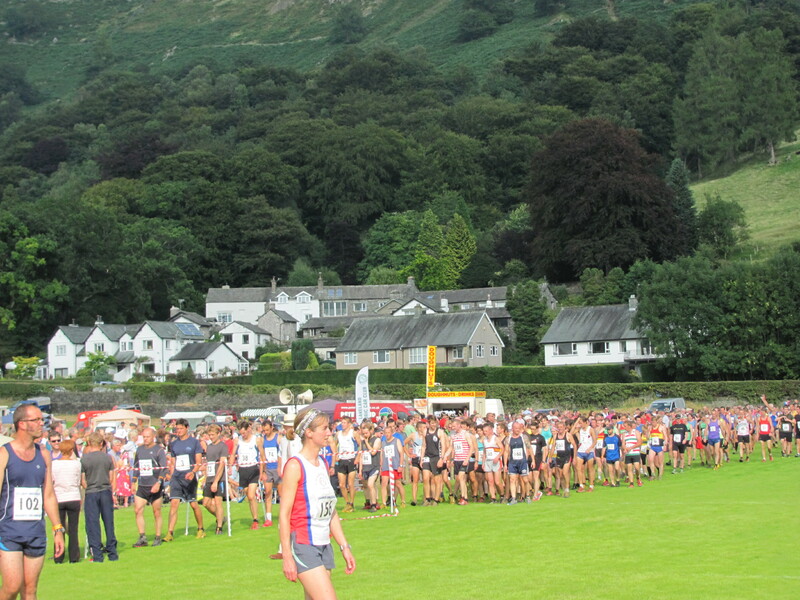 The Guides Races are the highlight of Grasmere Sports and the band appeared to send off the runners in the Senior Guides Race. 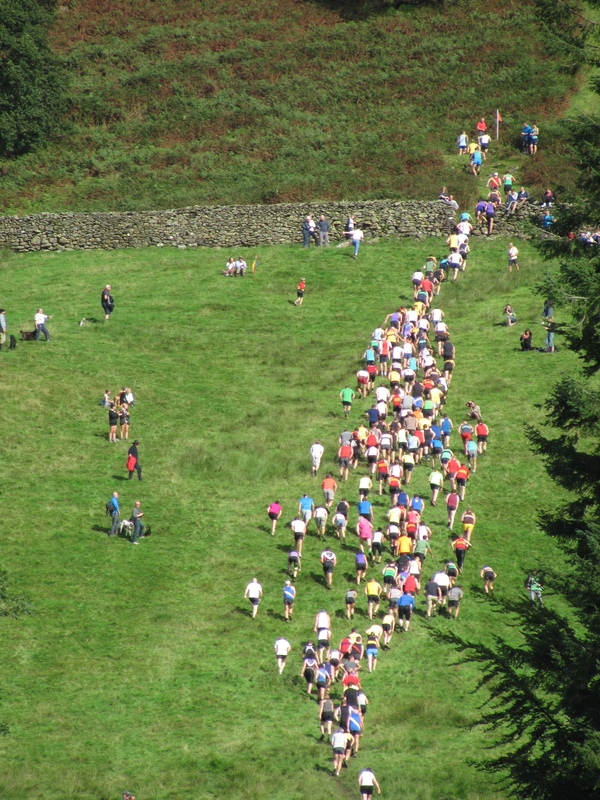 Last year there was a field of over 140 competitors, the most ever. This year that record was broken and 191 people took part. And off they went, streaming across the main road on the way up to the summit of Butter Crags. And it wasn’t long till the leaders were breaking away and they had reached the first wall. Fred Reeves set the record for the Senior Guides Race in 1978 so there is always a bit of excitement that this will be the year that it’s broken. Great times, but no record breaking this year, so Pete Bland Sports can keep the £500 additional prize money they put up again this year. 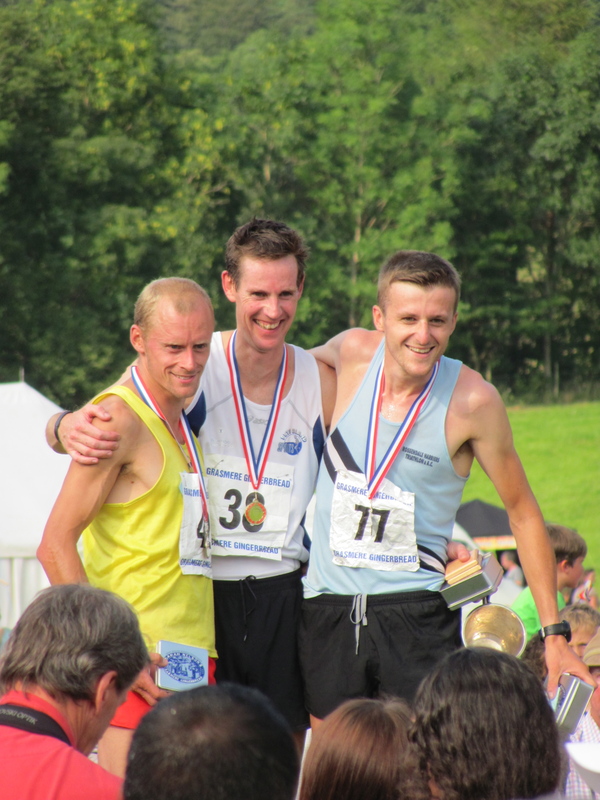 First was Rob Hope, Second, Rob Jebb and Third, Mike Addison. Note to parents. 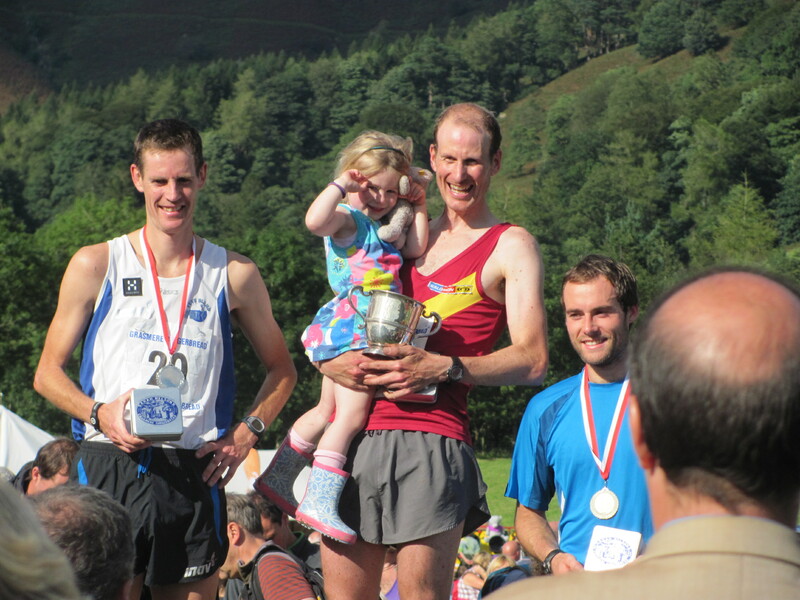 Perhaps if you want to raise a future fell runner it might be an idea to call them Rob! And the winners kept coming. It’s all in the taking part. And while many may not have broken any records they can be proud of the effort they put in. 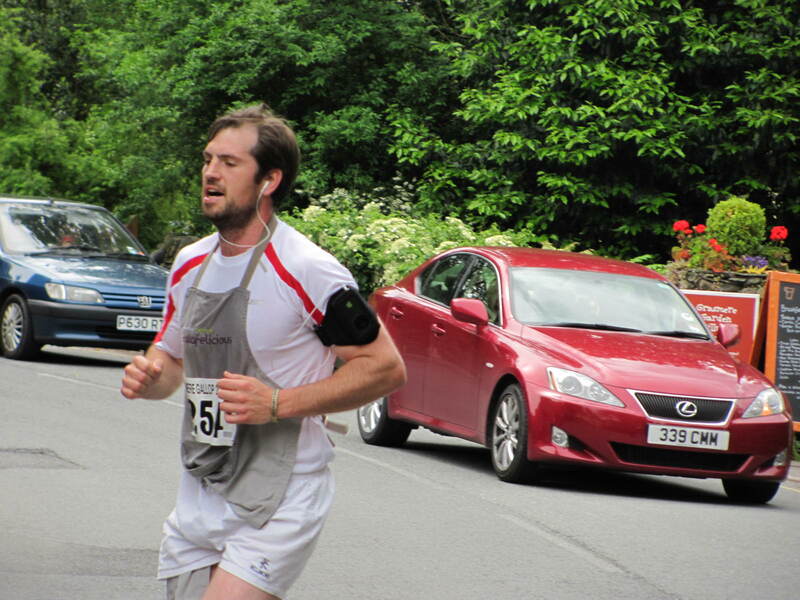 Even our local MP took part again. Now earlier I mentioned that sudden downpour we had and that it had made the fell side slippy. Well not everyone came out unscathed. 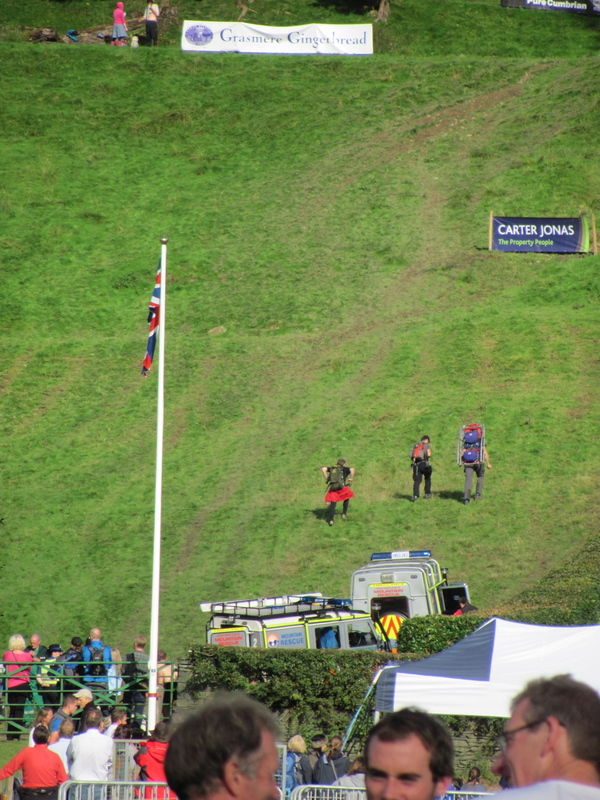 One competitor fell near the top and had a damaged ankle. 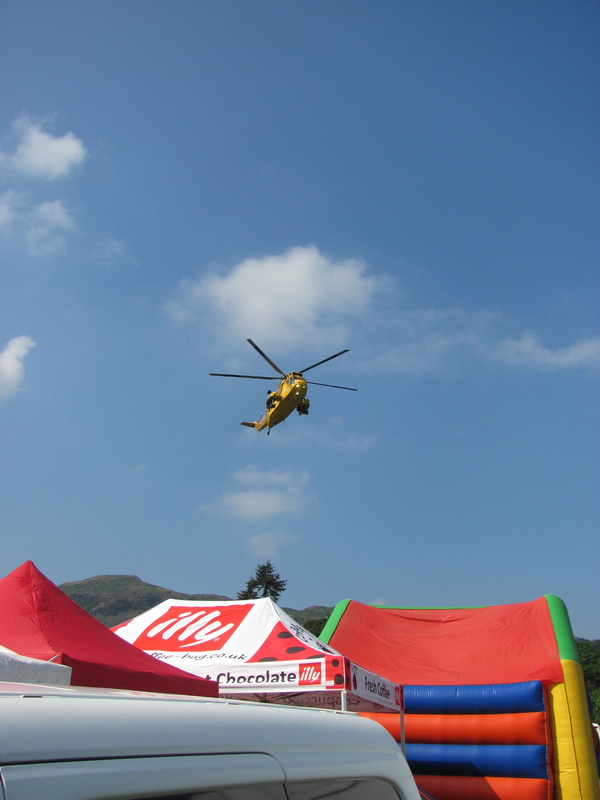 Additional entertainment was provided by Langdale and Ambleside Mountain Rescue having to attend. 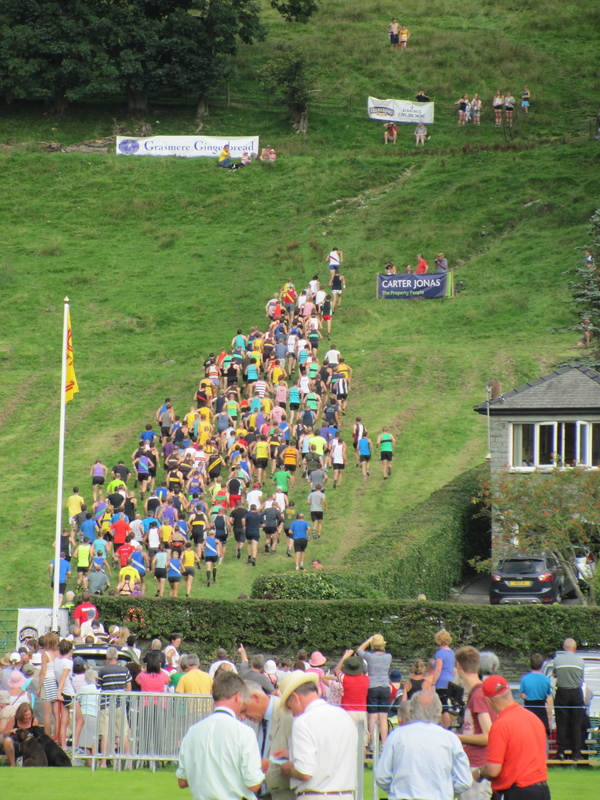 They were heading up the hill as the last runners were still coming down. Mind you they were on the field already. 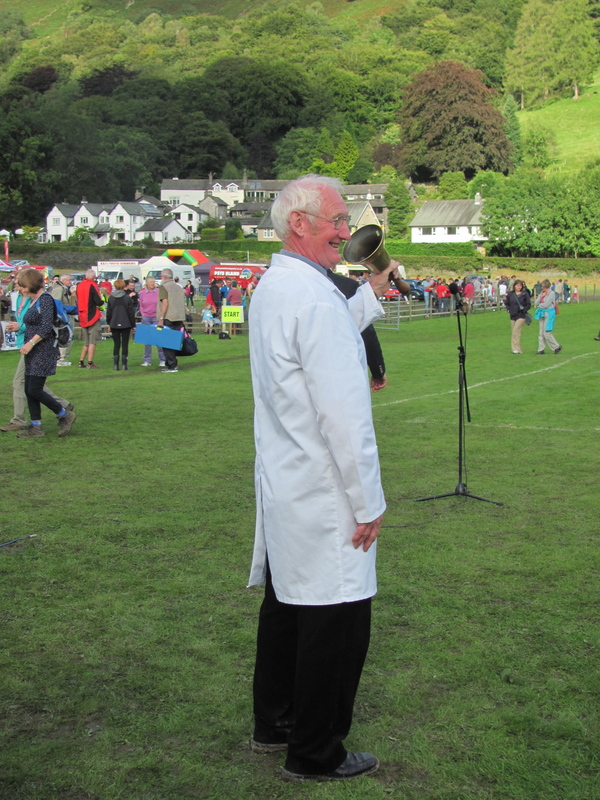 So that’s my round up of Grasmere Sports for this year, and here comes Bellman Mr Tommy Sedgwick to ring the bell and finish this year’s events. Today he used the bell that was used to open the sports in 1885. There seems to be a bit of a National Trust theme running through this blog at the moment, but credit where credit is due. 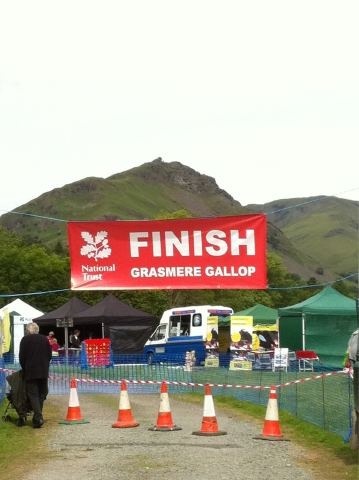 First of all they open a much needed Information Centre in the village, and now they have brought back the much loved Grasmere Gallop to the village. 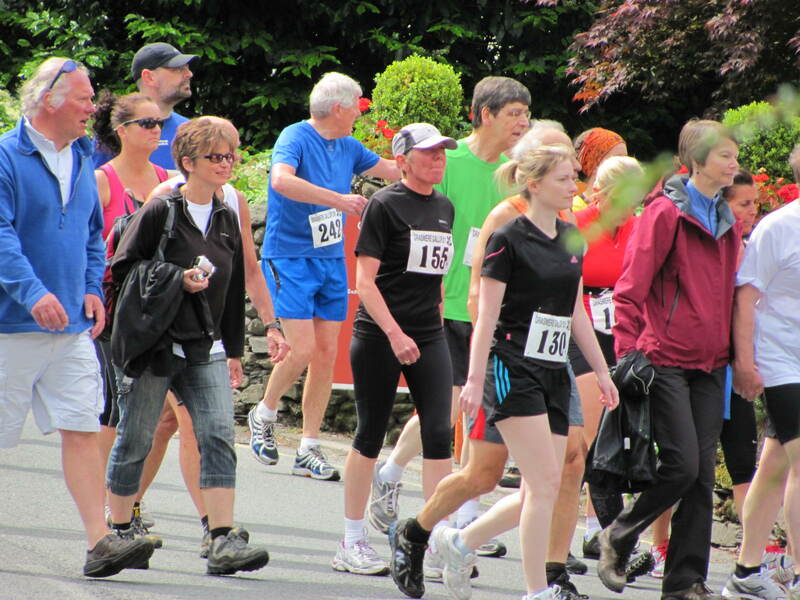 The 10K Gallop was something that locals and visitors really enjoyed but was cancelled due to lack of funding. Step in National Trust and it was all go again this year. 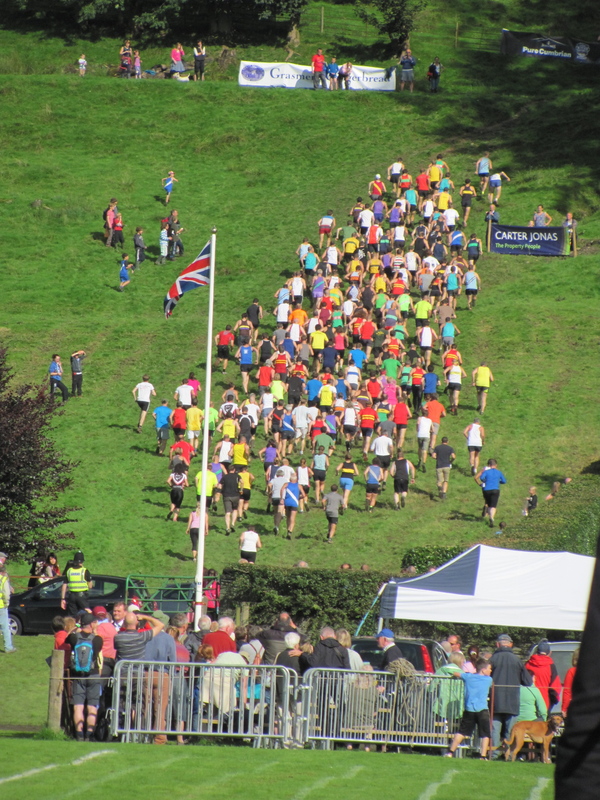 With a forecast looking fair for the morning, quite a few last minute entrants appeared and about 300 people took part on what was a really beautiful Grasmere morning. A nice touch was everyone being led to the start at the bottom of Red Bank road by a piper, the sound of pipes drifting through the village. Then it was a pull up Red Bank with a welcome water supply at the top. 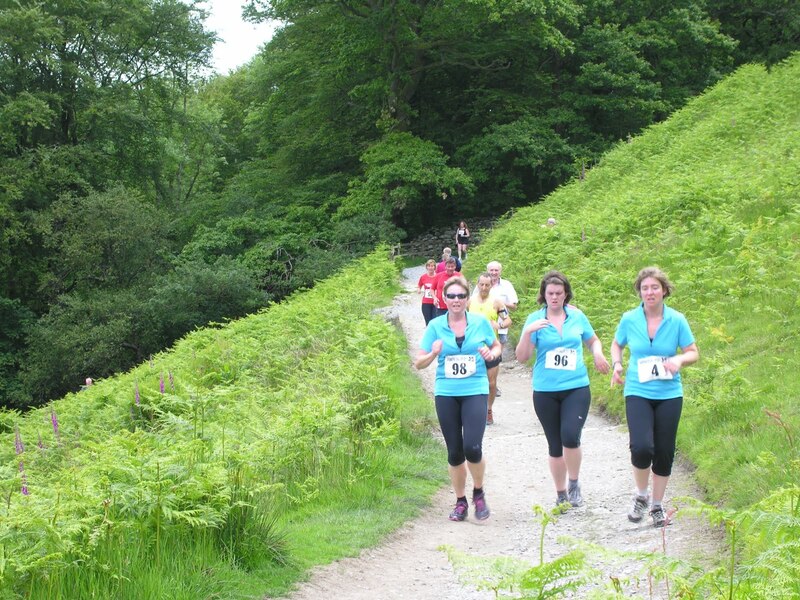 Down to the lake shore at Rydal, then through the ferns they ran. Some on their own and some in groups. All with one aim, to finish the race. It didn’t seem to take long at all before the runners headed back into he village. Clusters of people clapping loudly as they passed. Everyone seemed to be enjoying the event and there was more to come. A teddy Dash for the under 5’s and a family run to follow. Stop the traffic! Coming through. 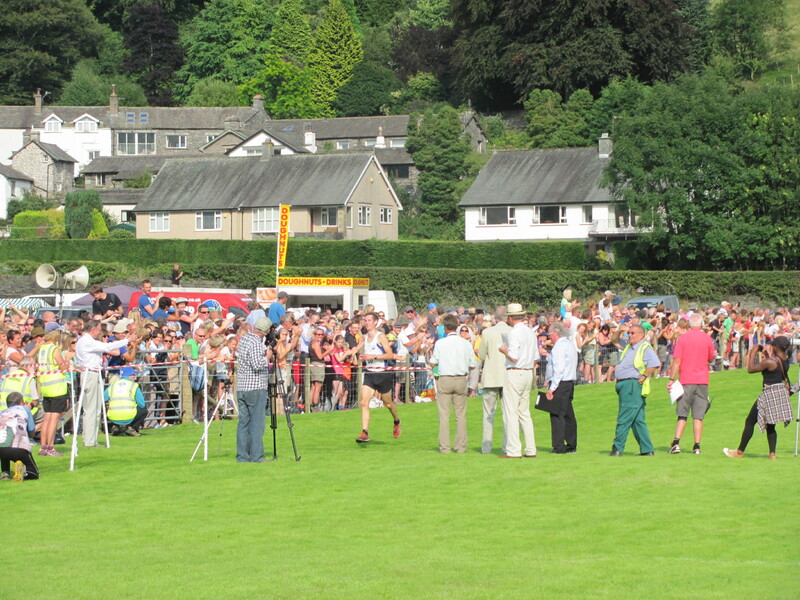 On the Sports Field spectators were enjoying the various stands, including Langdale and Ambleside Mountain Rescue and Made in Cumbria. 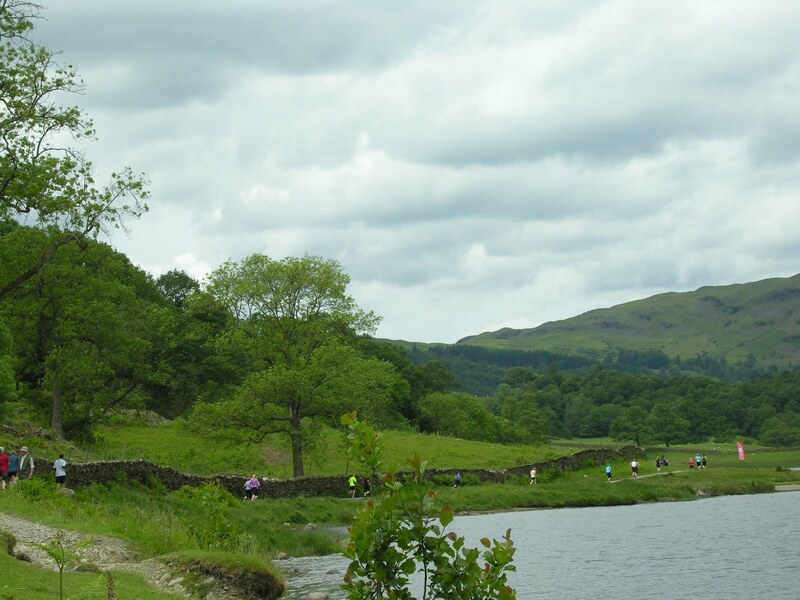 Not only were these runners having a great day out but were putting something back into the Lake District by supporting the National Trust. Back to the Sports Field and the final flag. From what I heard afterwards it truly was “a grand day out”. At last the clocks have changed and the nights will be getting lighter. 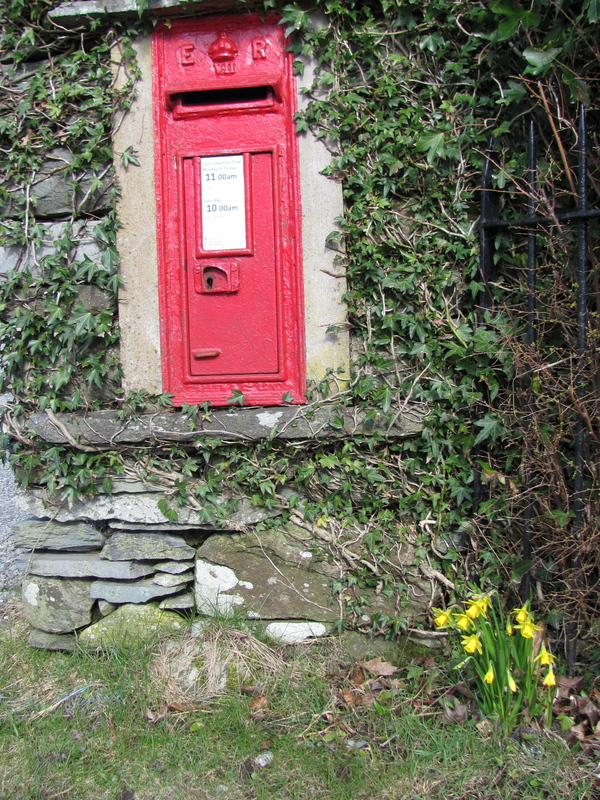 Summer is on it’s way and the signs are all around in Grasmere. When I looked out at the Sports Field the other day I had seen crowds of people hanging over the wall looking at something. Curiosity got the better of me so I went to investigate what this new spectator sport could be. 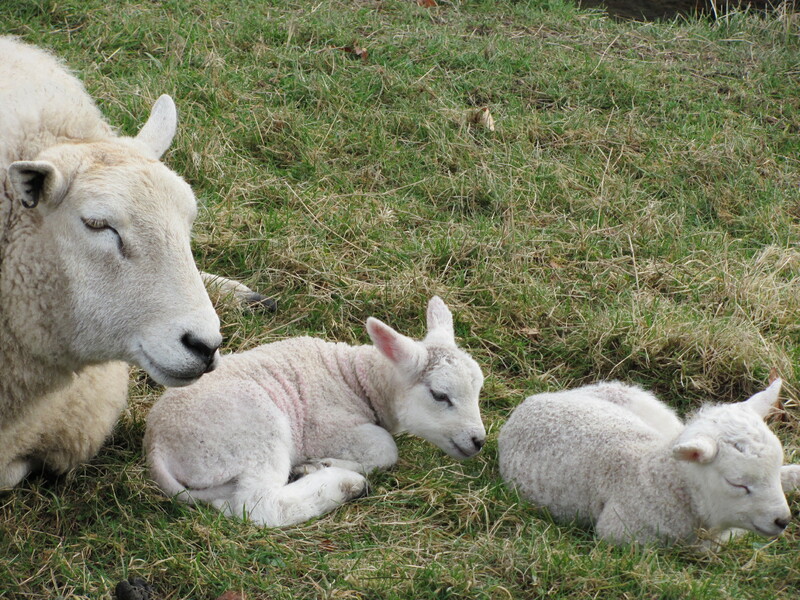 Well Grasmere Sports might draw the crowds every year but the sight of lambs being born on the field was coming a close second! Young and old were standing patiently watching the arrival of lambs right there in front of them, and I make no apologies for the number of lamb photos as they were just so cute. The sun was shining too, which was a welcome sight after the long winter. The National Trust Regional Headquarters are based in Grasmere and I had to make a visit there, so decided to carry on and come back round by the path that runs from just opposite, across the field and back into Grasmere. 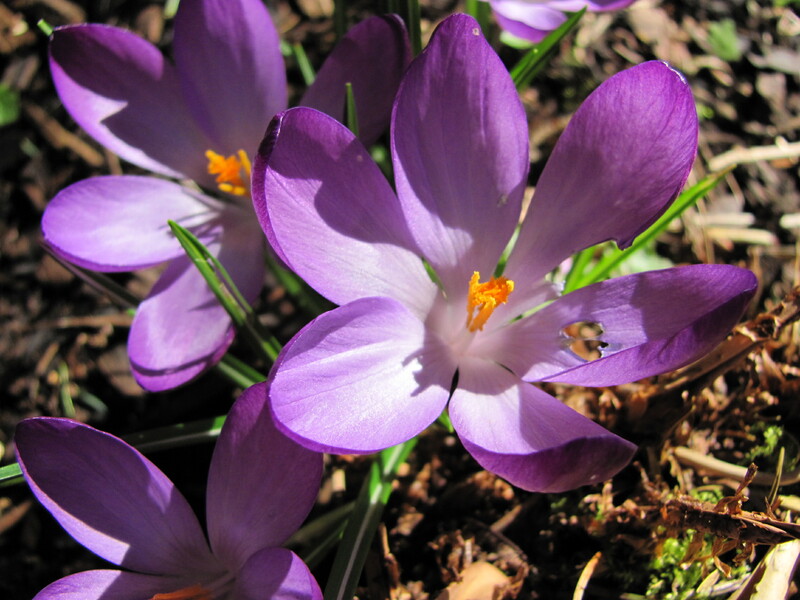 Everything was waking from the long Winter, the birds sounded happy and splashes of colour were appearing. When I came to the Millennium Bridge I decided to go round by Grasmere Daffodil Garden to see how the Daffs were progressing. Perfect timing! 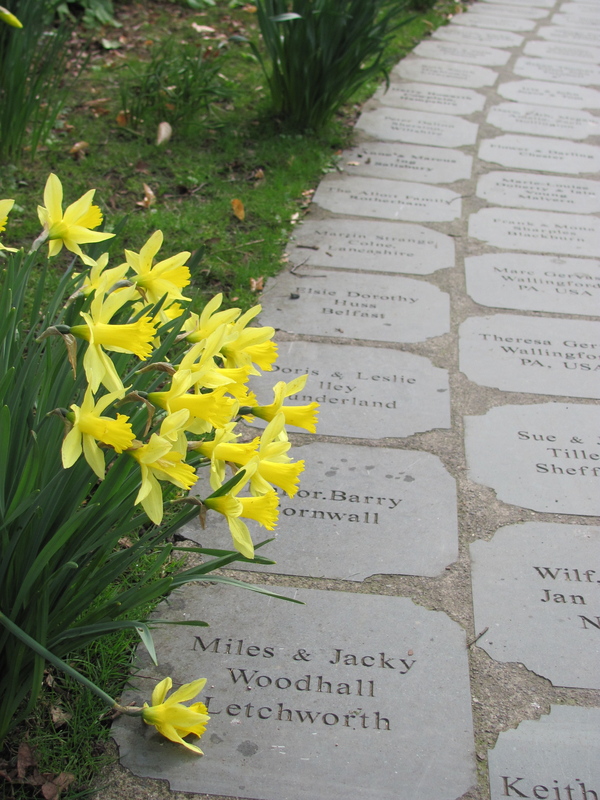 The daffodils were in full bloom and I noticed some new slabs had been laid on the path, so I went to take a look as several people had asked me to let them know when theirs were laid. 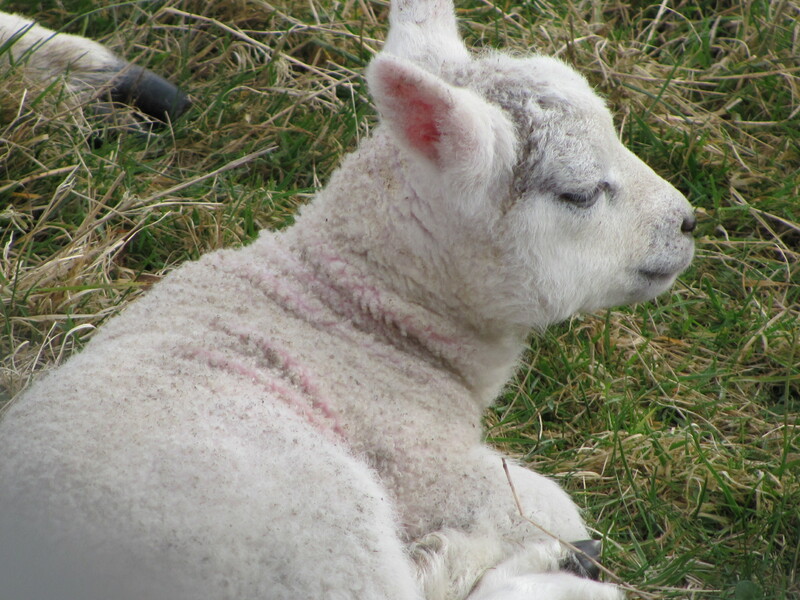 I had also seen another sign of Spring on my walk, some more new arrivals will be coming soon. 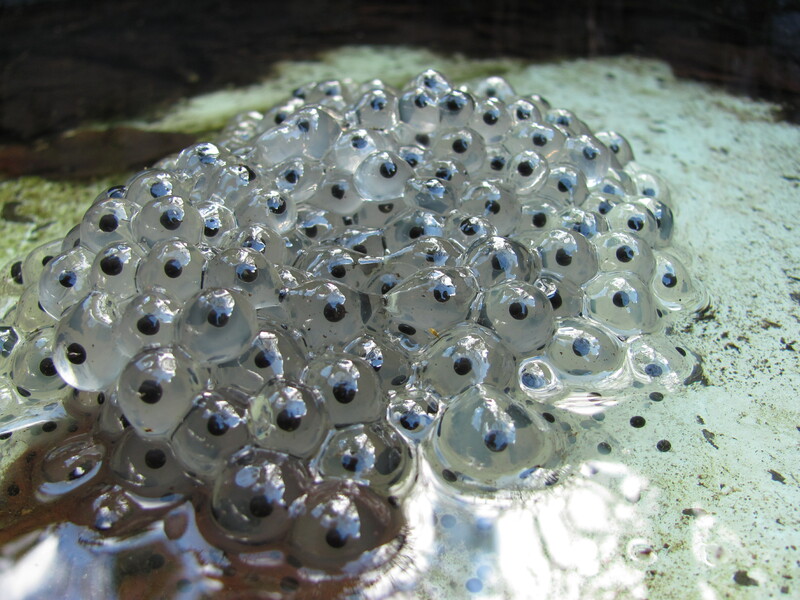 Hard to believe this will produce frogs swimming about, but strangely fascinating! 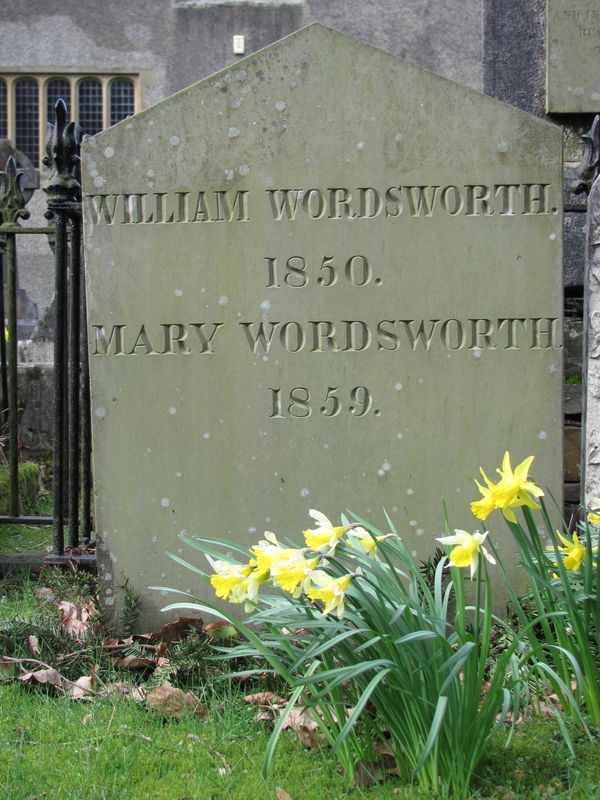 Just time to give William Wordsworth a nod on the way past, and nice to see he had his own Daffodils to enjoy. 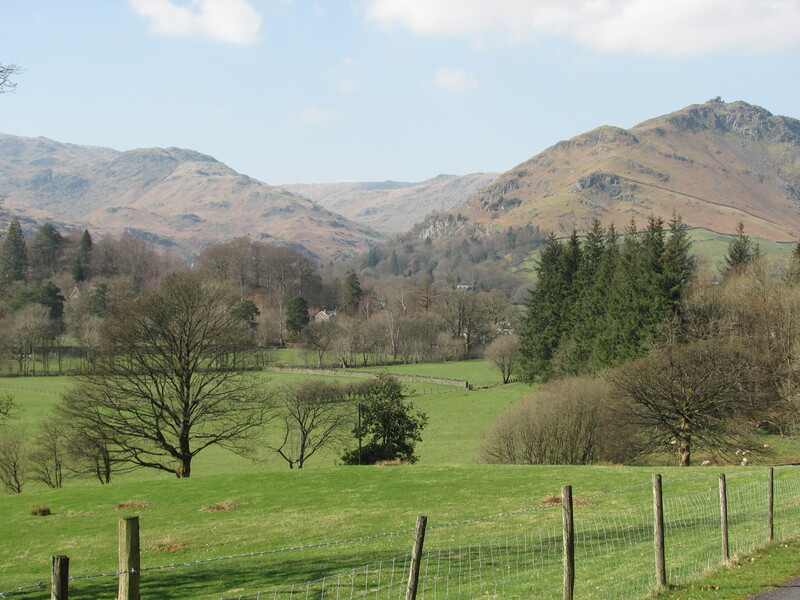 Grasmere is perfect at any time of year but Spring has to be one of the best times to visit as the village awakes for the tourist season about to begin. Ok you know i’m going to do it! 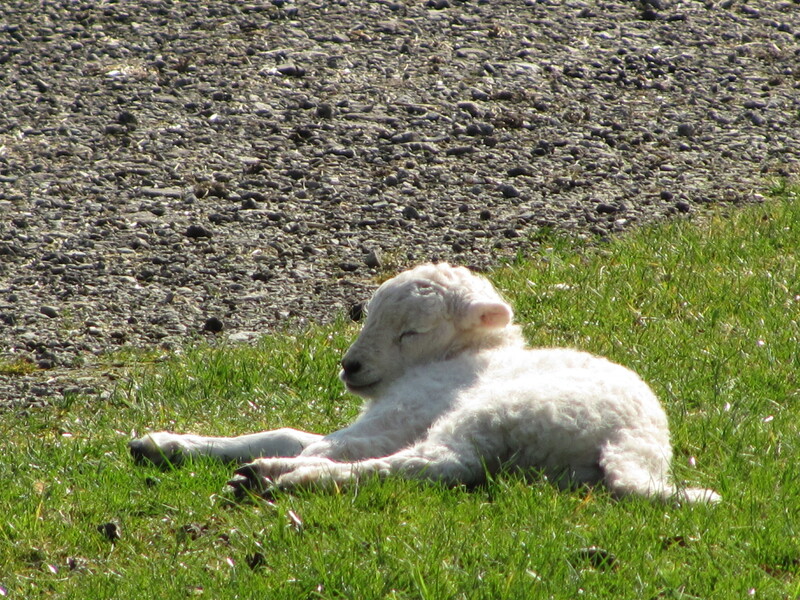 One last lamb photo. 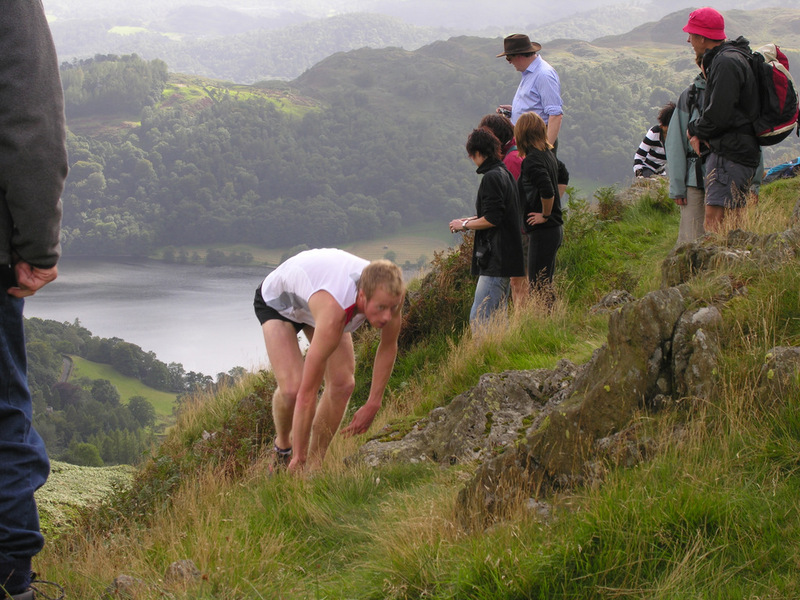 One of the highlights of the Grasmere calendar is the world famous Grasmere Sports. 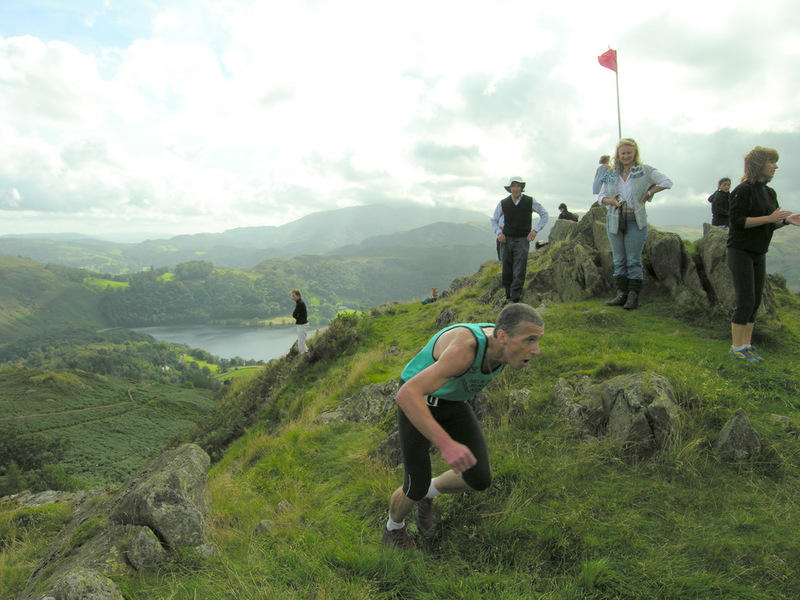 Set in a natural amphitheatre the surroundings for Grasmere sports are awe inspiring and the fells provide an ideal setting for fell racing and hound trails. 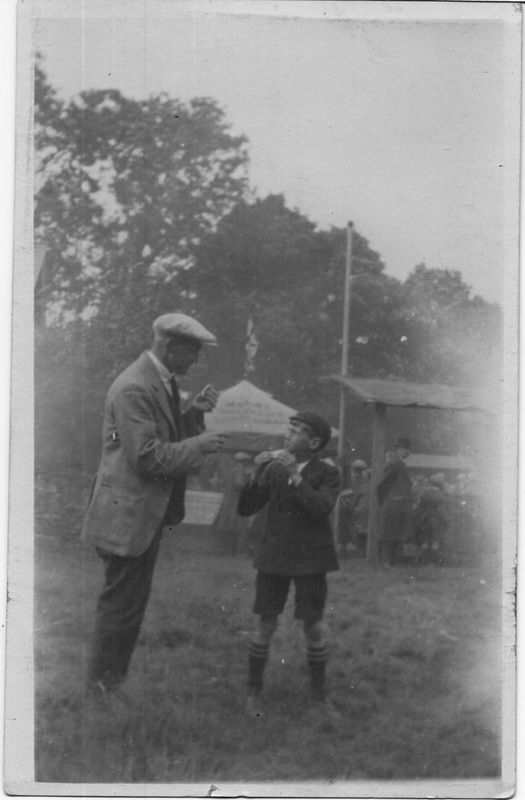 Earliest photos of the sports are by William Baldry who was also the village schoolmaster. He became the official photographer for the sports committee in 1872 and remained so for 20years. This is all the more amazing when you realise the first known photograph of the Lake District was taken by a customs officer, John Marsden in 1852 only 20 years before. 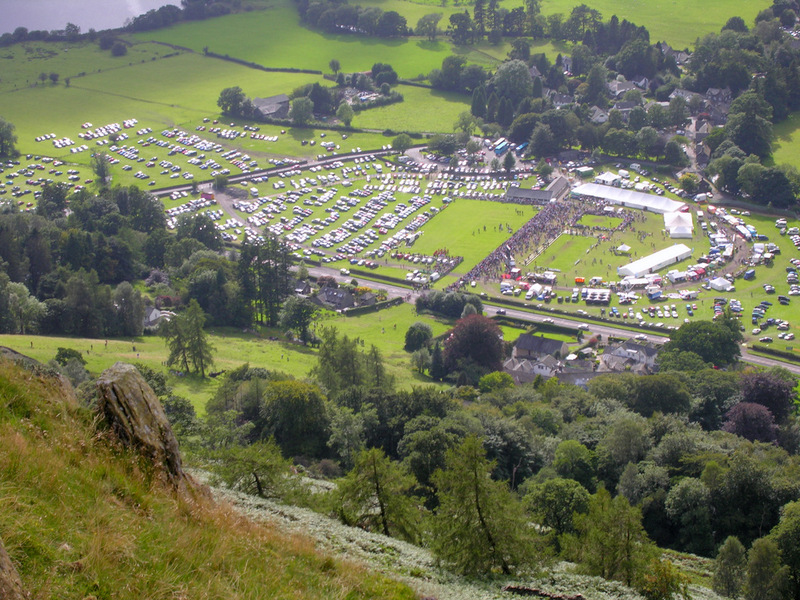 Looking down on Grasmere Sports field from Butter Crags. 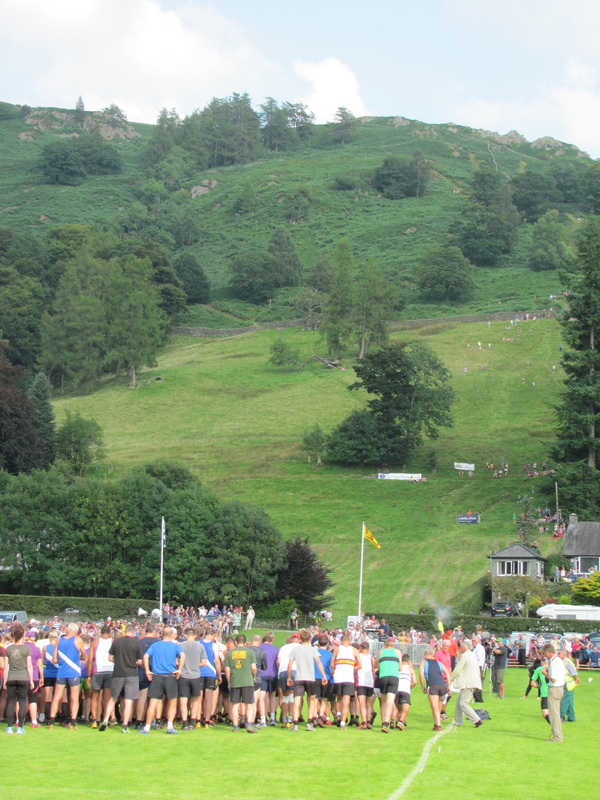 Apart from records of horse racing in the early 17th Century first records of sports in Grasmere occur in 1852. These took place on the Moss. 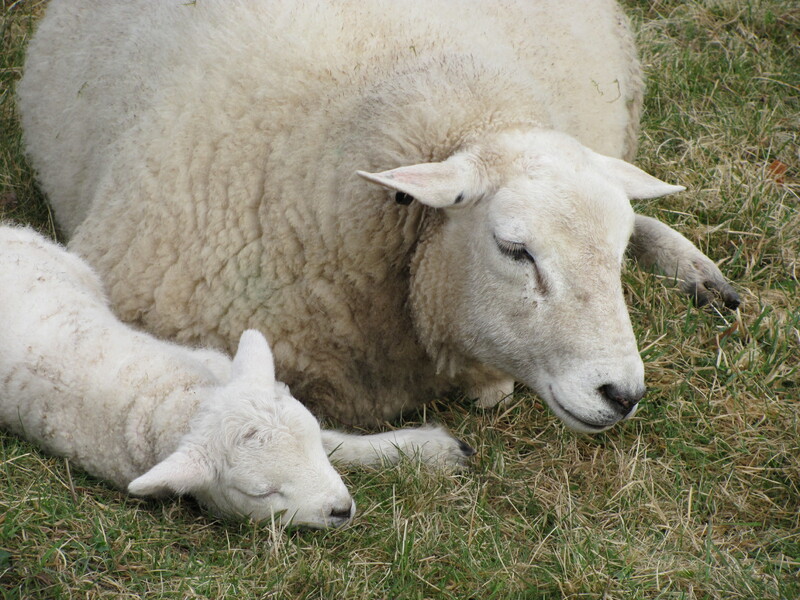 Next records are 1865 where in conjunction with the annual sheep fair they were held on Hudson’s Field which is near the Wordsworth Hotel (formerly the Rothay Hotel). The sports then moved to Pavement End to a field still known as “the old sports field”. Next Broadgate meadow was used and finally in 1919 the “shed field” which is the current home of the sports was used for the first time. The arrival of “Lordy” the late Earl of Lonsdale, a great sportsman and keen wrestler was a real spectacle. 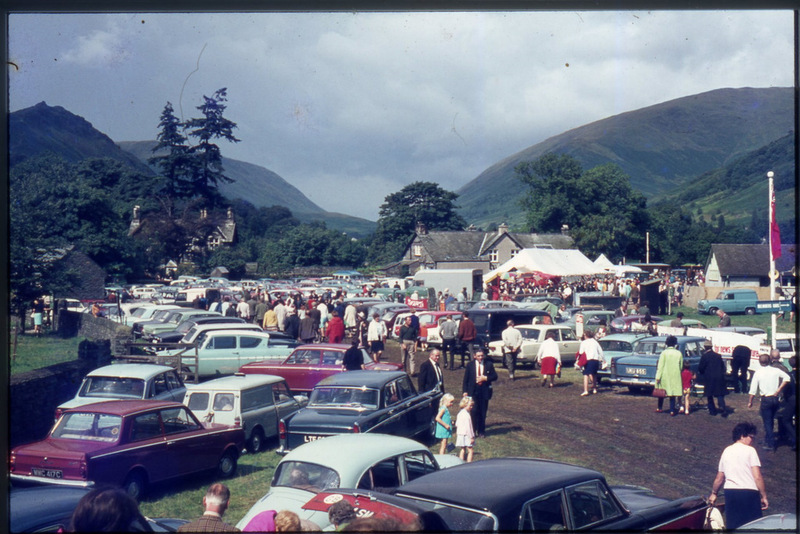 The Earl’s house party would travel from Lowther Estate in a fleet of bright yellow and black Rolls Royce across to Ullswater, over Kirkstone Pass and on to the sports field parking near the grandstand. It was a great social occasion as well as a sporting event. 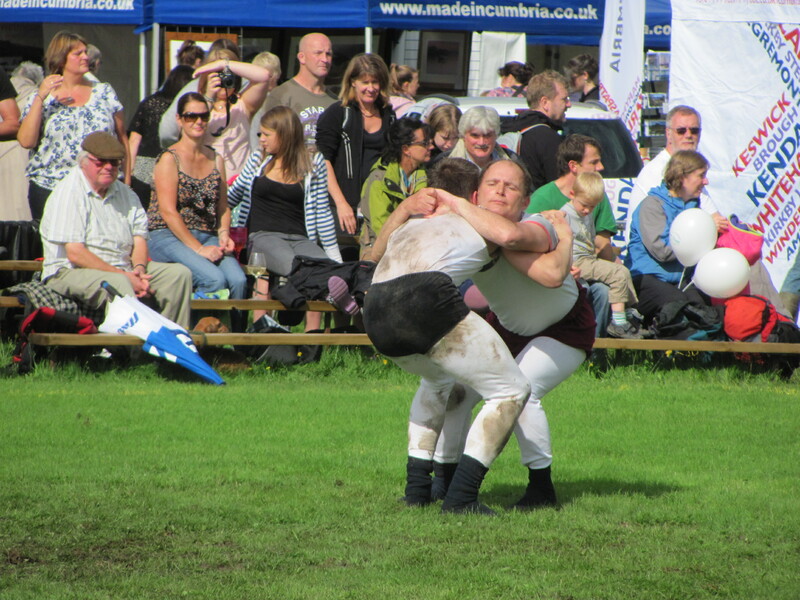 Nowadays it is not just Westmorland folk who come to enjoy the event but people from all over the world, some to watch, some to compete. 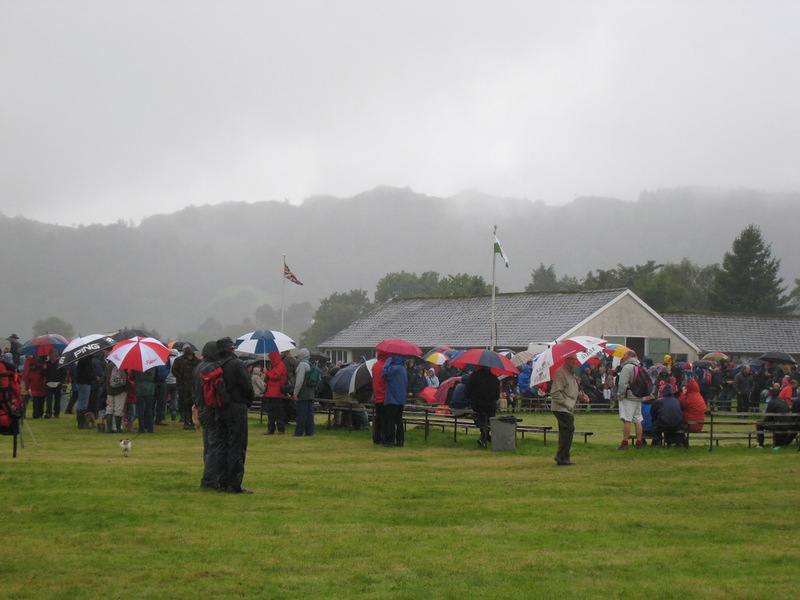 Grasmere folk optimistically say the weather is “allus fine for sports” however come rain or shine it still carries on. 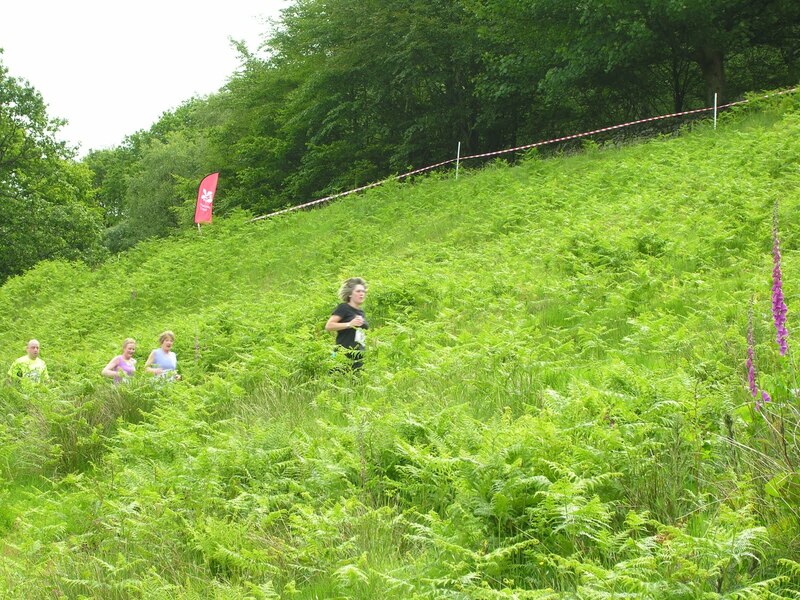 Fell running in fine weather. 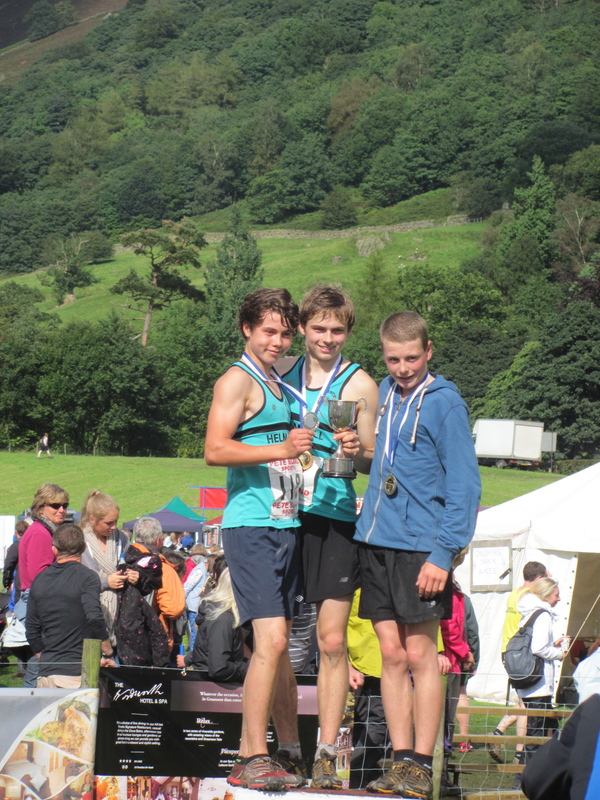 The highlight of Grasmere Sports has to be the Senior Guide Race. This is an event that has to be seen to be believed. From the sports field across the road, up Brackenfell to the summit of Butter Crags and back down in 12mins. 21.6 seconds. No wonder Joss Naylor tried to urge the organisers of the 2012 Olympics to include it. When the first runner appears back in the field the band play “Hail the conquering hero”, well deserved. The Guide race was first introduced in 1868. 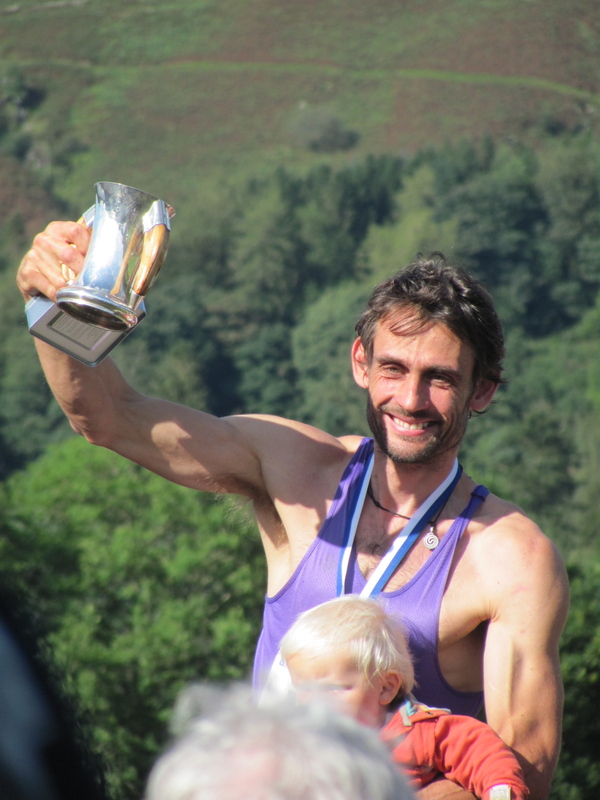 The current record was set by Fred Reeves in 1978 and Rob Jebb came very close in 2008 missing it by 10 seconds. The atmosphere in the sports field was electric. Anyone who beats the record will get £500 pounds from Pete Bland but so far his money is safe. One can only have total respect for these athletes. 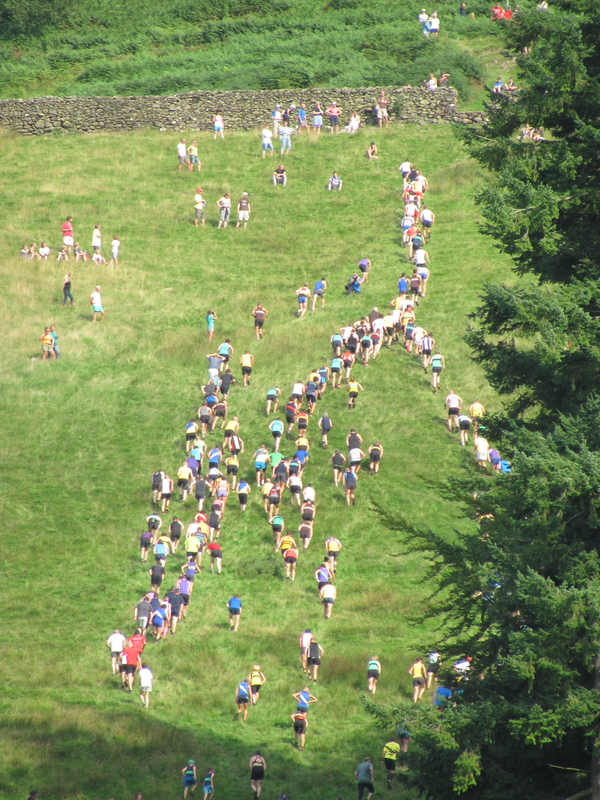 I have never been able to make my mind up whether it is best to watch from the field where a swarm of little ants thunder up the fell, or at the top to cheer everyone on. Off they go. Start of the Guide race. 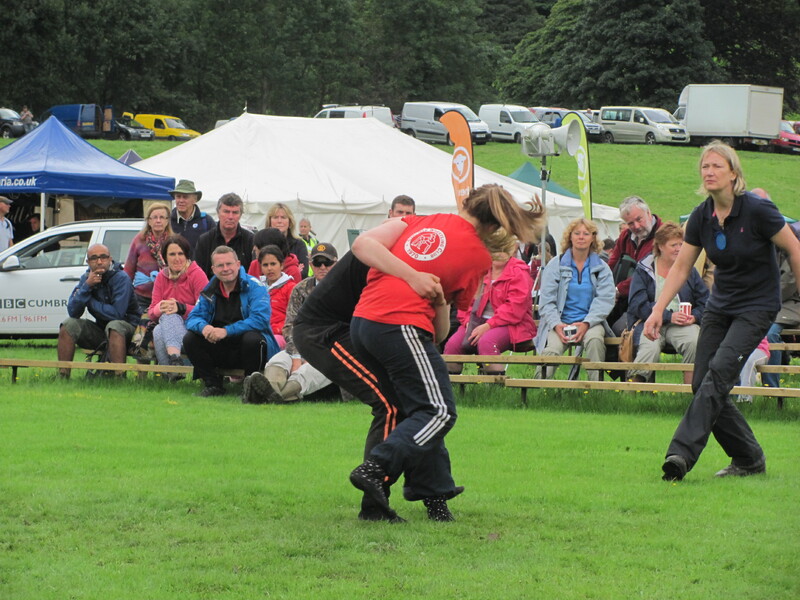 Another popular event is the Cumberland and Westmorland Wrestling. 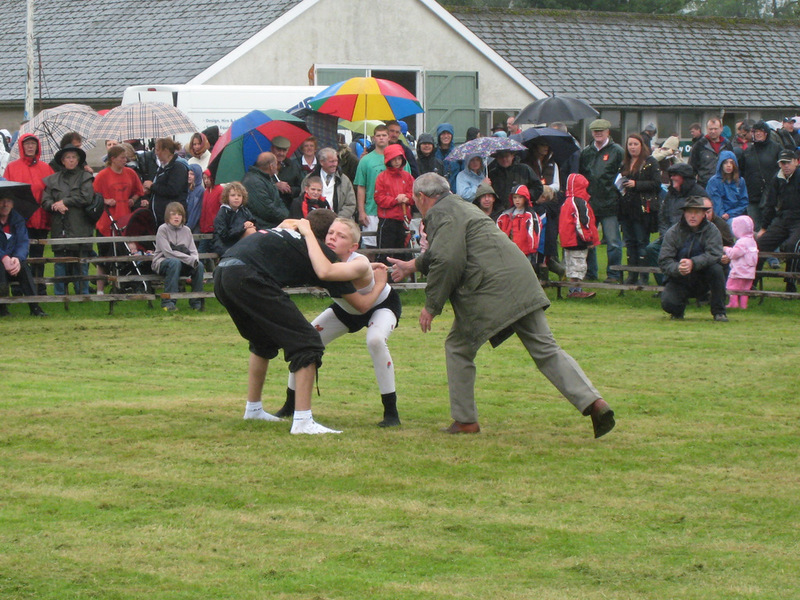 From time immemorial Grasmere lads had “wrestling bouts” annually after the Rushbearing. 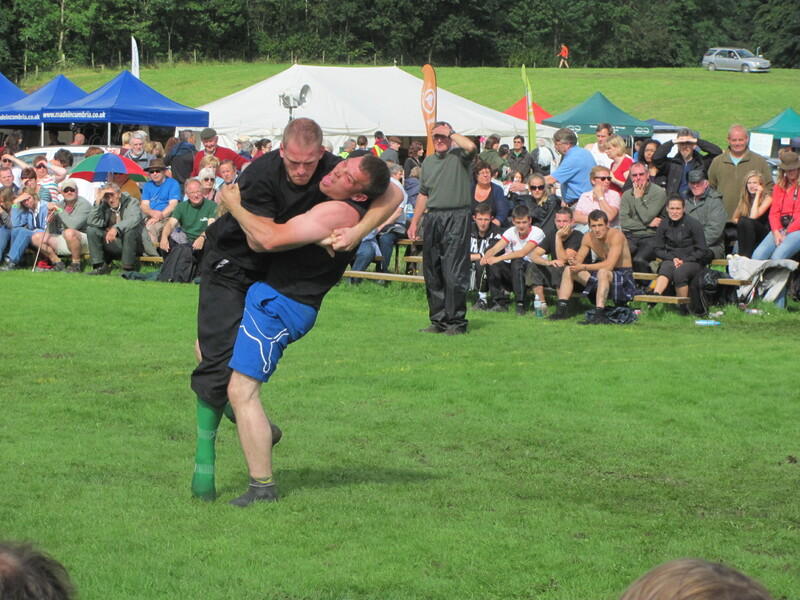 To start the competitors must “tek hod” by linking their fingers together behind the back of their opponent. The match is decided by the best of three falls. In former times the winners were awarded leather belts which were greatly prized possessions. Now the prizes are cups and cash payments. One condition of entry as a wrestler is the correct “fit-up” – “a plush seat-piece” and a white vest. 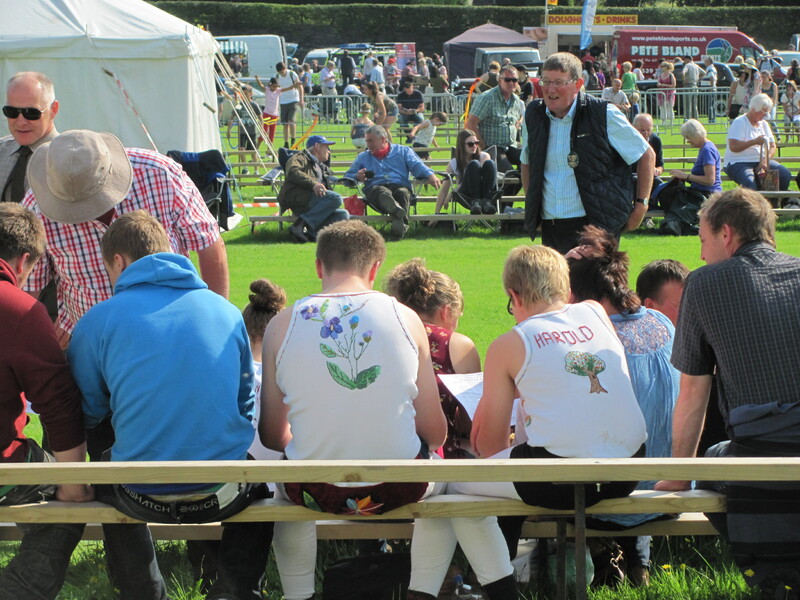 Some of the costumes are highly embroidered and one of the most amusing things are seeing the judges inspecting embroidered bottoms to award the prize for neatest costume!. 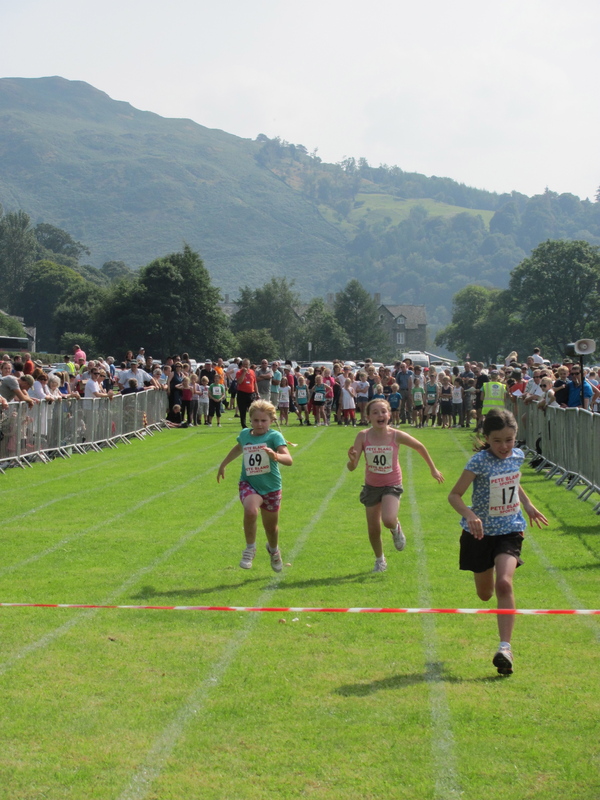 More recently called Grasmere Sports and Show to appeal to a wider audience, the sporting events will always be at the heart of it.This year children’s races for 5-10year olds are being re-introduced after a lapse of nearly 10 years and the organisers are always looking for something new to thrill the crowds with. Mountain Biking was introduced in 1995 and is a popular event. 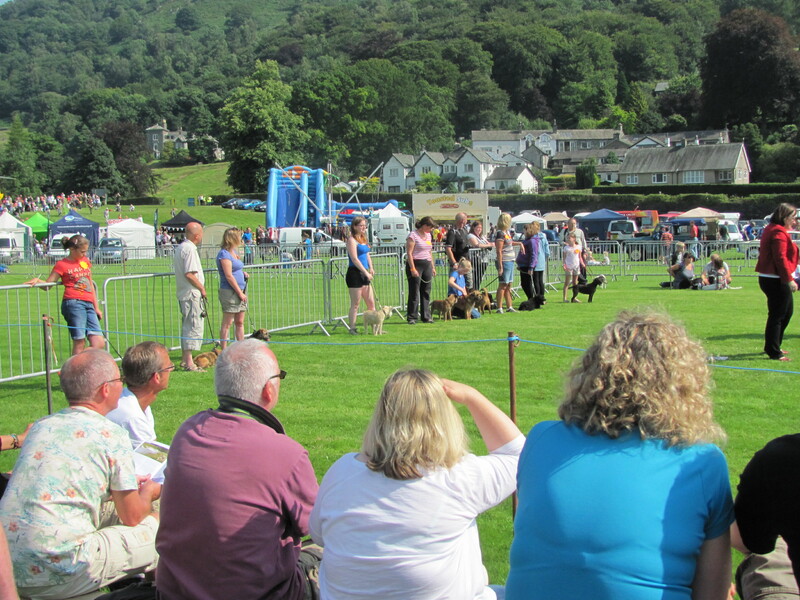 Hound Trails, Dog shows, Paragliding, have all been seen at the show. 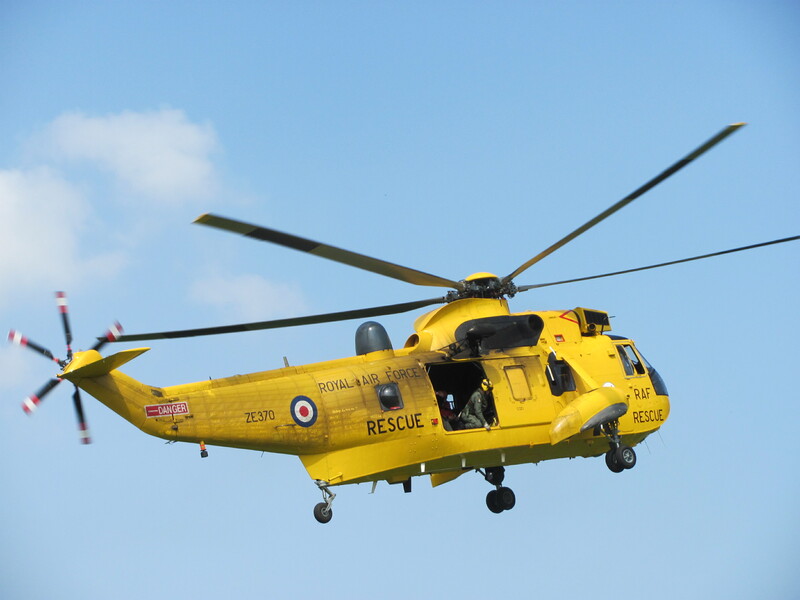 This year there is to be (weather permitting) a display by the RAF Falcon’s Team and Mountain Rescue demonstration with a Sea King Helicopter. 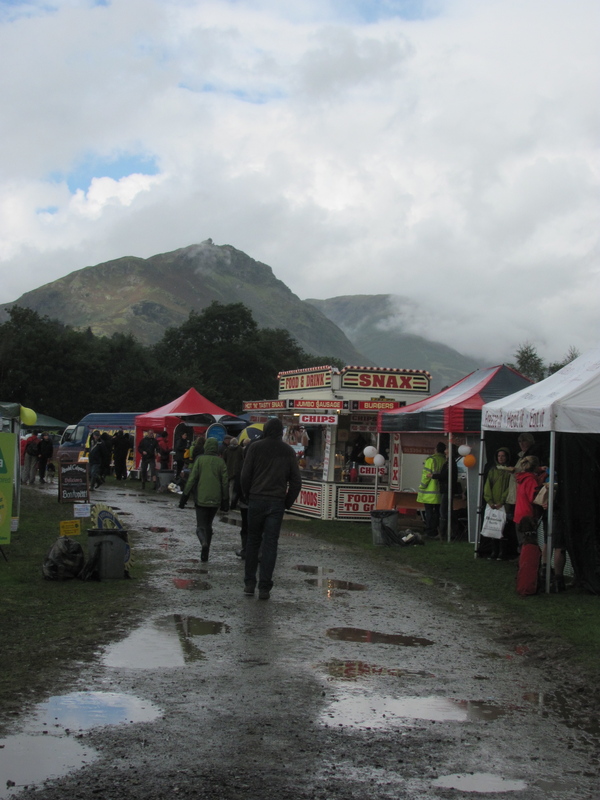 Stalls with all manner of goods, Craft tents, Grasmere Sports has it all. And of course you can get a hand stamp and leave the field anytime to explore Grasmere Village. Late 20's photo of father in law at Grasmere Sports. 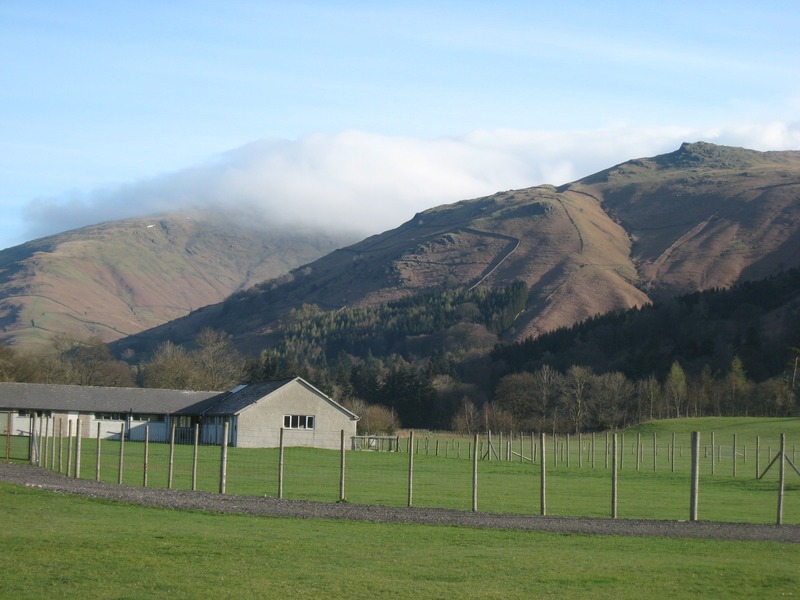 My father in law is now well into his 90’s however he was telling me the other day about travelling to Grasmere Sports from Barrow in Furness when he was a toddler. It is his earliest memory, he describes travelling in a pearly white coach with a canvas roof. It had been raining heavily and with a childs curiousity he poked the roof and water flooded over the sides soaking everyone!. And yes he will be visiting the show again this year, probably one of the few who can remember seeing so many.